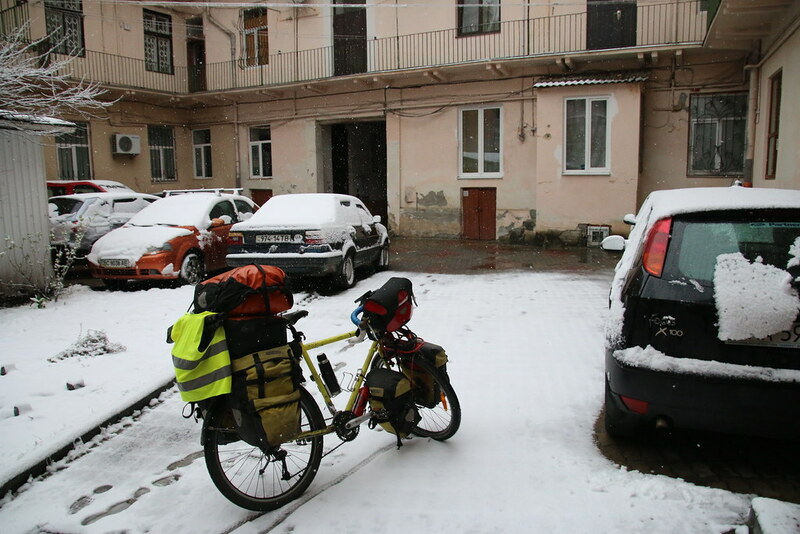 After I packed everything from the flat I rented for a month, I moved to a hostel to stay just one more night in Lviv before leaving. 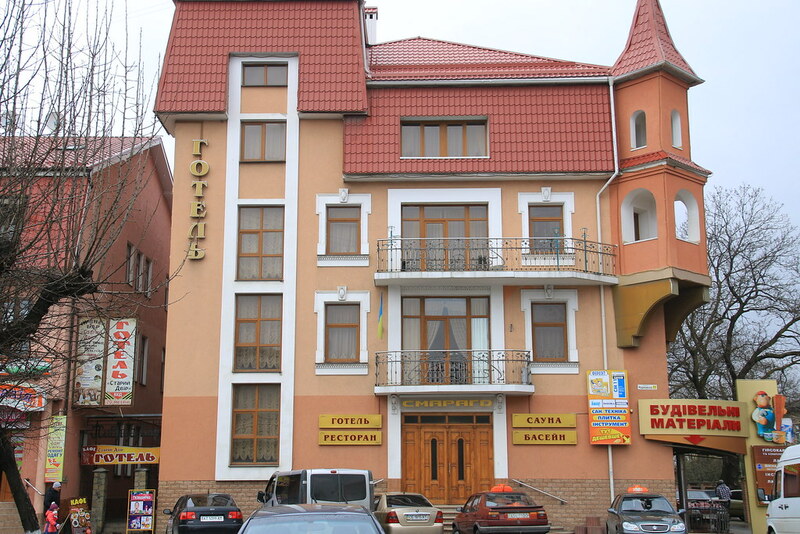 The hostel I stayed at the first day in Lviv was cheaper, but I chose more expensive one because the hostel was at the first floor. I had beer with Sergii at the last night to say good bye. On the way to the hostel, it rained too much. And then when I went out to cycle at the next morning, I was surprised. What was this?? 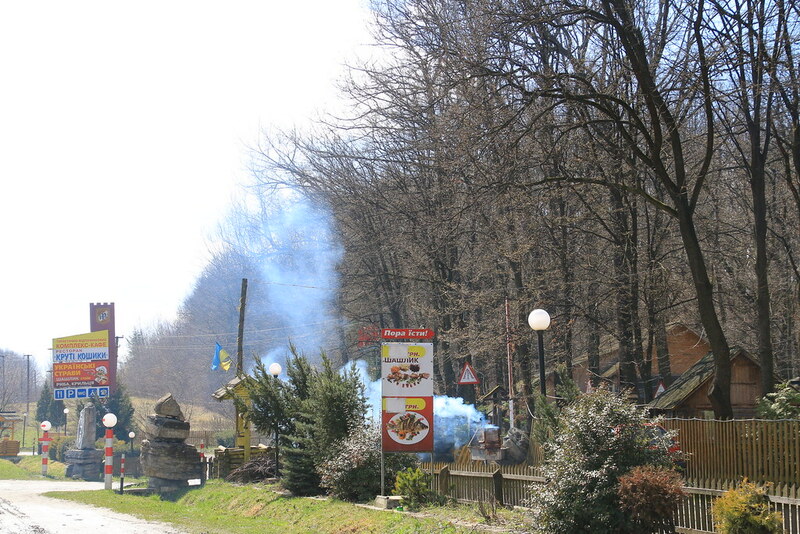 Most of days I’ve stayed in Lvive were very sunny, so I thought finally spring came. 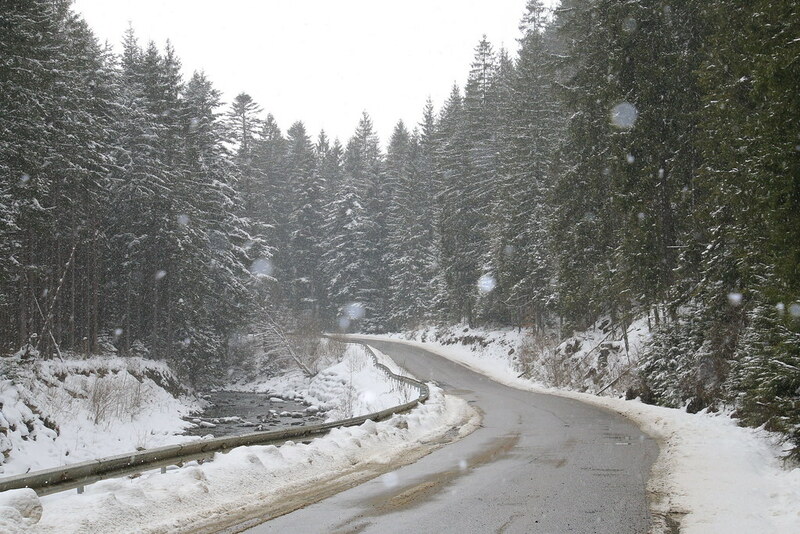 But suddenly it snowed when I tried to hit the road again. I had thought there would be no more snow for now. But my expectation which was very normal in spring was wrong. It was 2nd of spring. 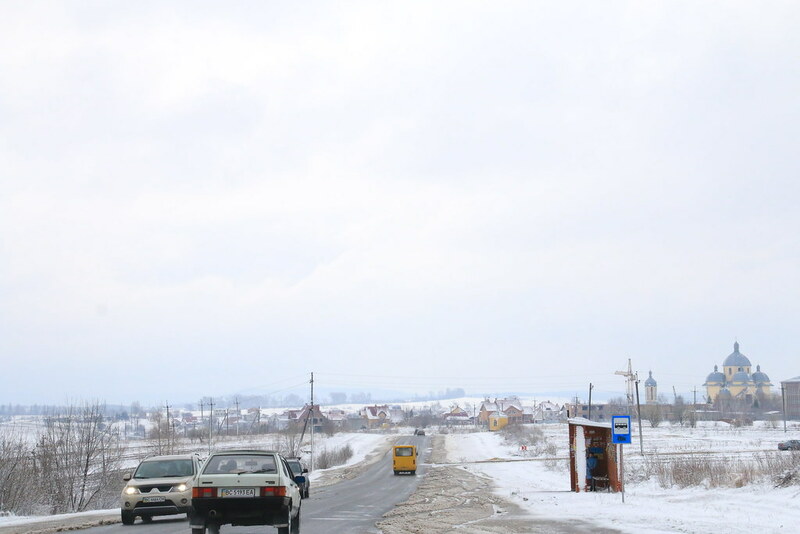 Lviv was not around mountain area. But how come here snow? 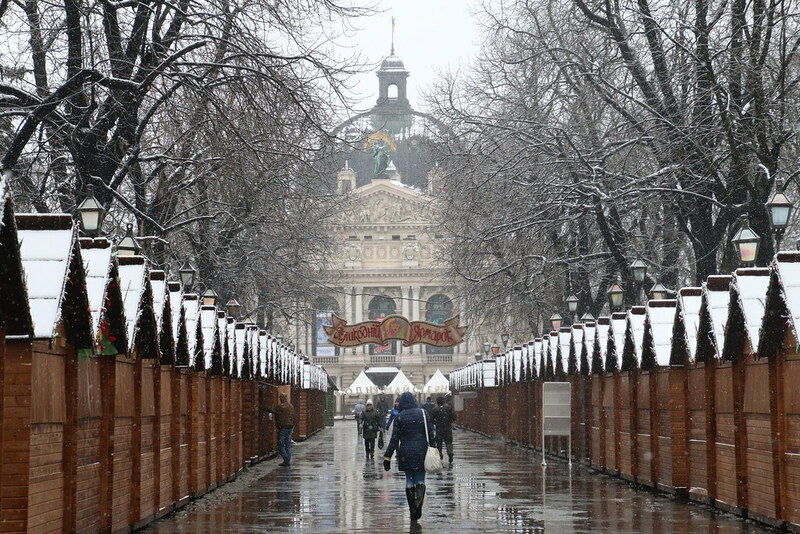 Everything looked unfamiliar because I’ve never seen snow scenery in Lviv. It was amazingly comfortable to stay at my own flat, but now it was time to forget about my palace. So, I was actually a bit sad and upset. Besides the weather gave me weird feeling. 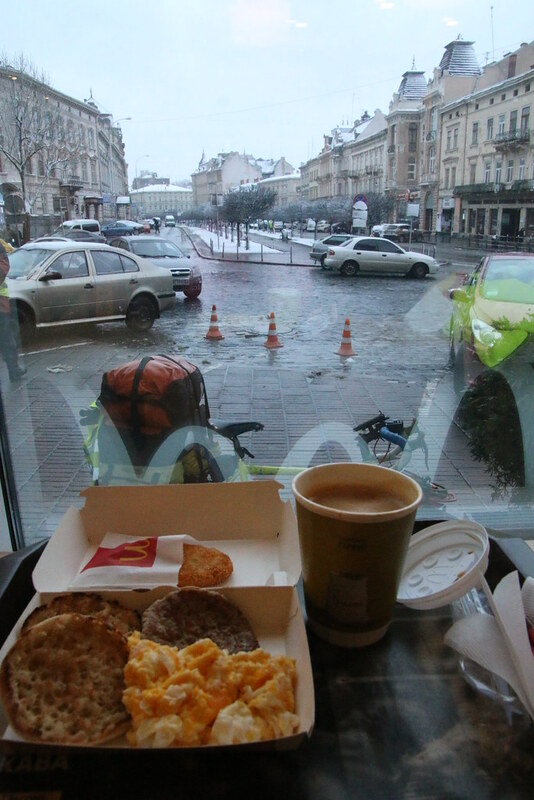 Breakfast was really nothing in the hostel, so I stopped at McDonald. (3.5$/One year ago 9.6$)- As I wrote at the last post, Ukraine’s currency collapsed because of the war. One year ago 1$ was 8 UAH. But now it was 1$=22 UAH. So I would write two difference prices. By the way I would not calculate inflation rate because I didn’t know how much everything was increased. So actually the price of one year ago could be cheaper than what I calculated. Frankly speaking, I was glad to see the snow again. I didn’t see snowing since Finland, so I felt a bit excited. 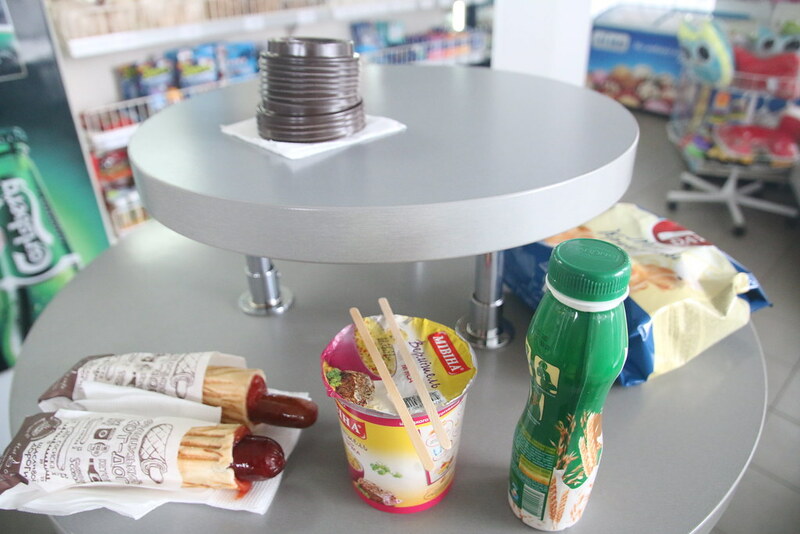 I was hungry so I bought a few things from a small grocery at a petrol station. 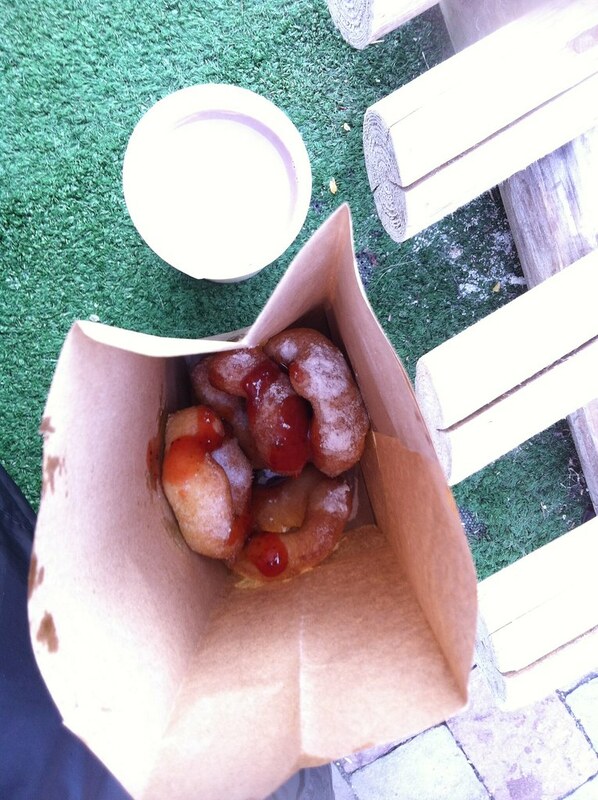 But it was too much, so I put one of sausages to the bag. There was no fork, so I made a chopstick with stir stick for coffee. Yeah.. Asian instinct. It was cheaper than the hostel I stayed last night, so I wanted to stay more nights. But I had to leave because actually I booked a hotel through Booking.com for the next city. 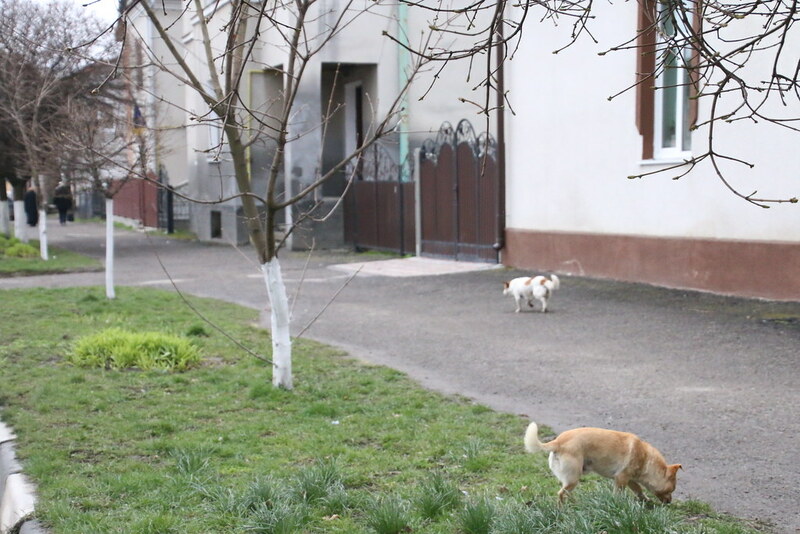 There were many street dogs in Ukraine. The village was something special that people were selling broom which was made of branch. 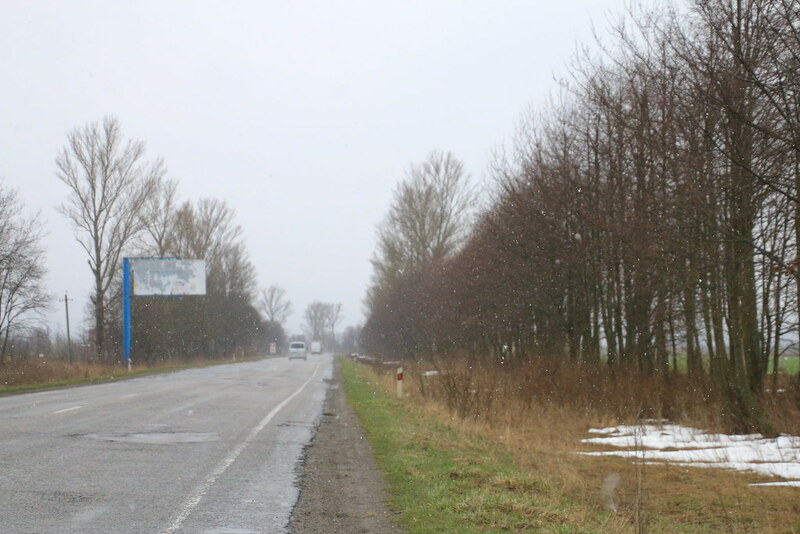 When I was about to enter to my destination of today, it started snowing. Why keeping snowing on April? I booked a flat through Booking.com. It was not a hotel, so I had to wait the worker to get a key. But then it snowed more and more suddenly. It was almost like snow storm that it hurts my face. I also checked Airbnb on online, but Airbnb was more expensive than Booking.com. Moreover Airbnb took too much service fee from the guest and host, so I didn’t like their service. 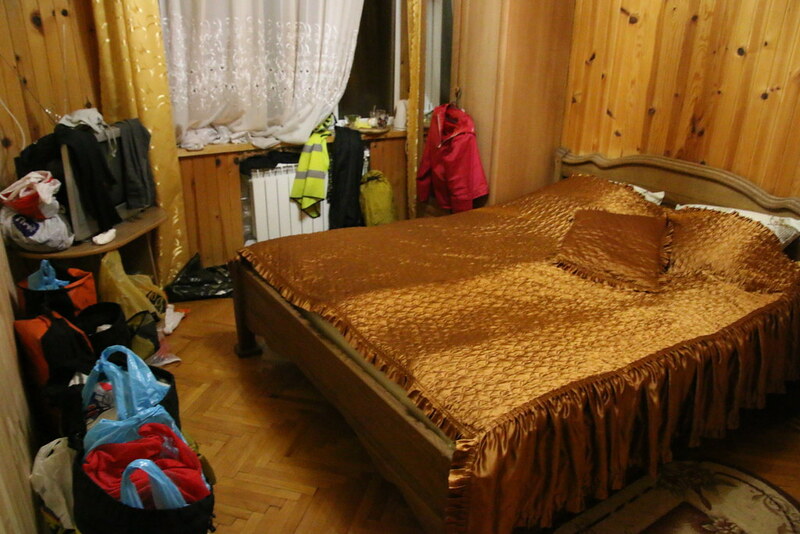 Even there were too many bad stories after using Airbnb’s service. When I researched on Booking.com, there were also renting a flat. So I decided to use Booking.com. By the way I’ve never used booking.com over three and half years. It was my first time ever to use it. Unexpectedly, it looked good. 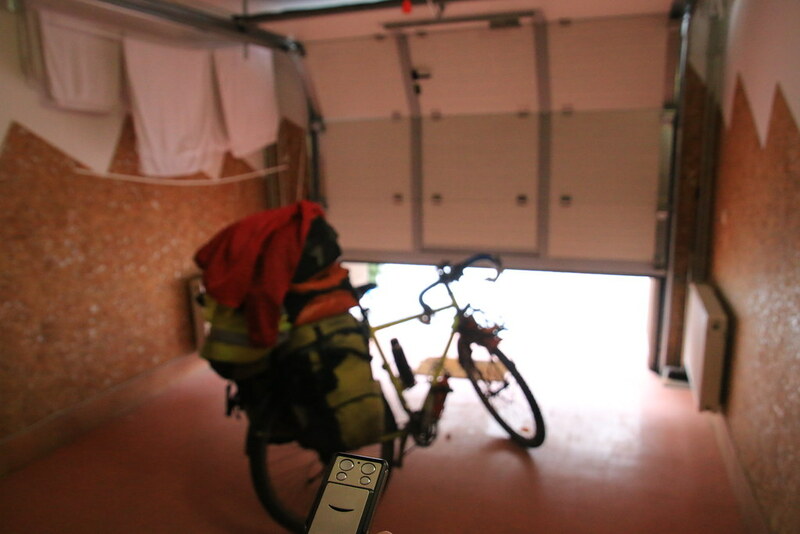 I had to open a main gate and garage with the remote control. Specially to open the main gate with remote control gave me feeling of rich. Lol. I could go up to the flat from the garage. I was so surprised that it looked much better than the picture on Booking.com. I really liked the wall which looked like some professional worker drew. 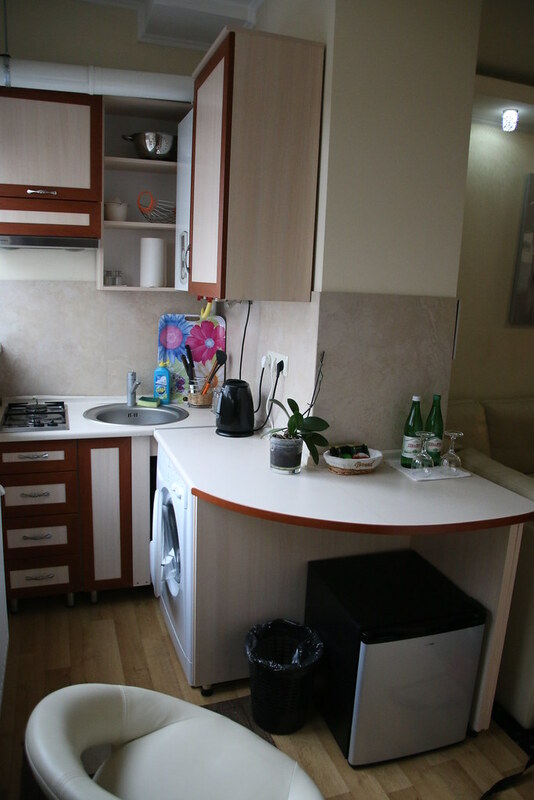 There were facilities on the kitchen to cook and laundry. 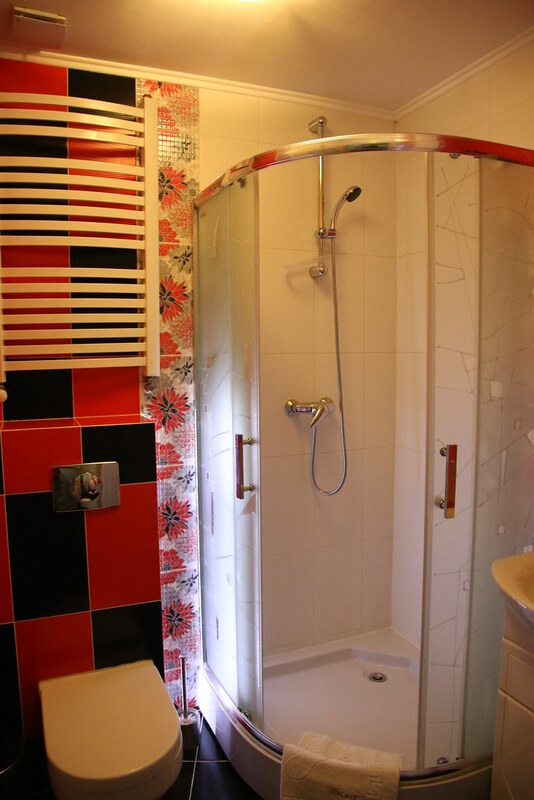 Even the toilet was lovely with bright color. I only saw old buildings in Ukraine so far. 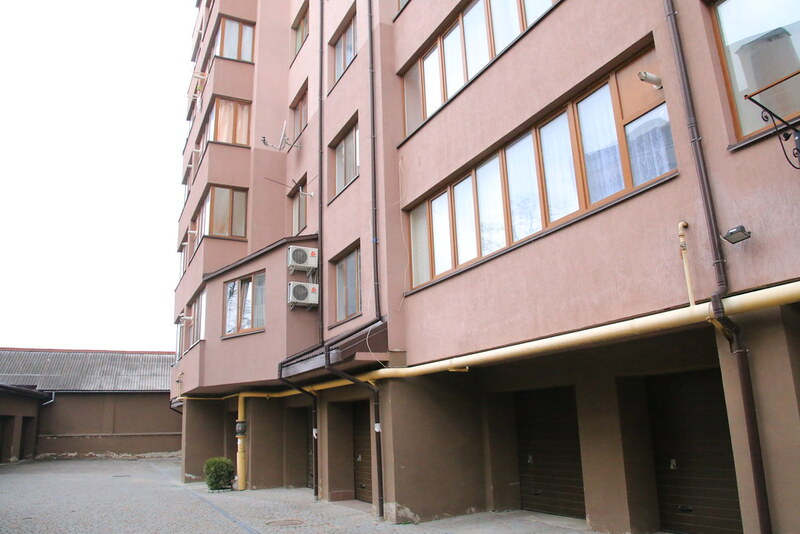 So, it was interesting to see this kind of new apartment. 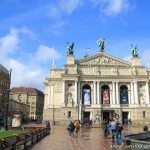 The city was normal like other European cities. I took the rest on the weekend. 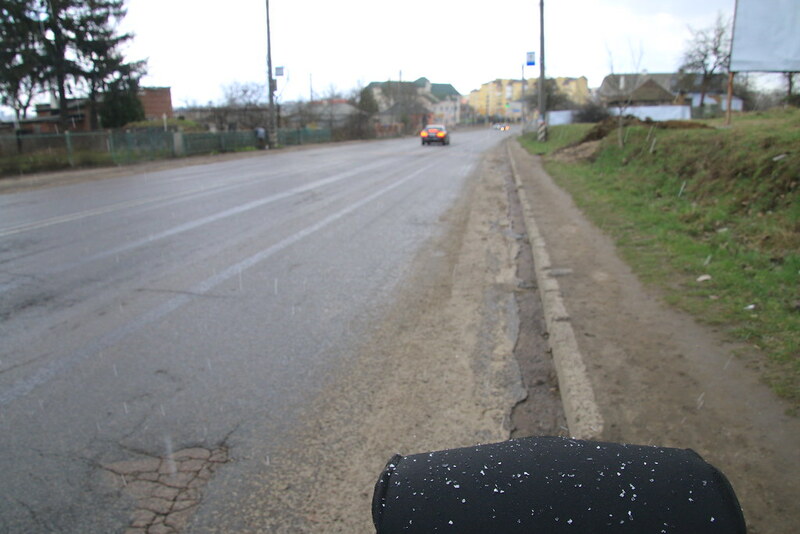 It snowed again suddenly once I cycled again. 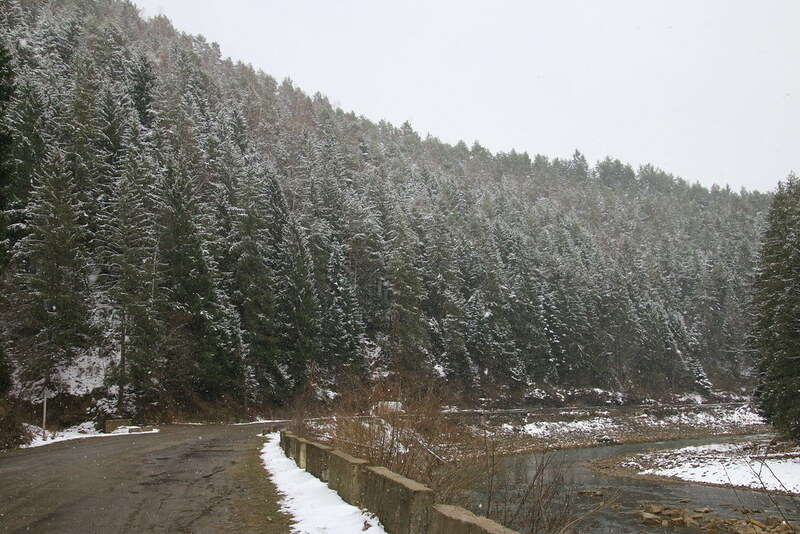 It was really not mountain area yet that I could not understand why it snowed on April. The worker who gave me the key told me she was born in this town and now she was 26 years old. She said she never saw the snow in her city on April. Weirdly I felt a bit sorry. It looked like I was carrying snow. Hm.. Actually I was not the one who brought snow… It was Lucky!! 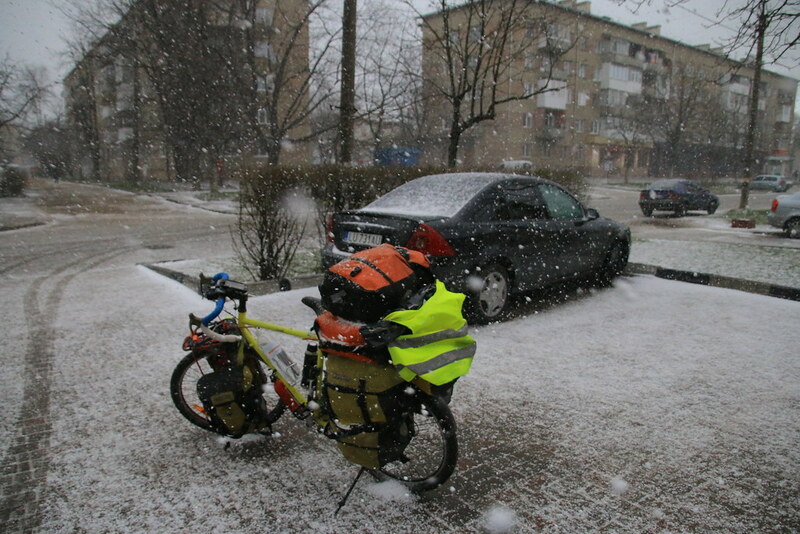 Lucky (my bicycle’s name) kept bringing snow. At the afternoon, the weather was a bit clear. I was looking for a restaurant over 30 minutes. I went around and around the town, but it was really hard to find it. I asked a local people, but it was not easy. Then I found a restaurant by chance. Actually I passed here over three times. I didn’t know why I could not see it at the first time. 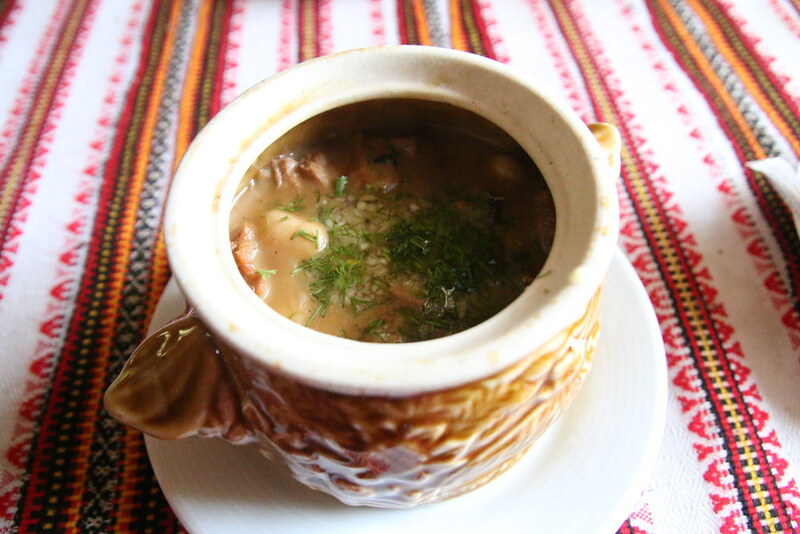 I ordered typical Ukrainian soup first. There was some meat on the menu, but it was only 150g (5 ounce). So, I ordered three meats. After I finished the soup, I got three big plates. Why didn’t they give me all together in one plate? It looked like I was so greedy pig. It was too much that I packed one of them later. When I went out from the restaurant, I found that lucky called the snow again. Maybe lucky was too bored to wait me. It kept snowing, which made me very hard because it melted and wet my clothes. Today again I would stay at the hotel I booked on Booking.com. 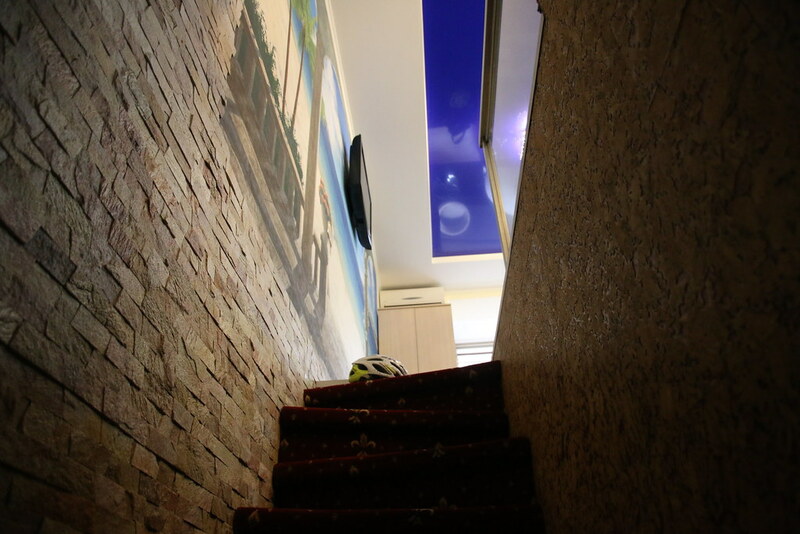 The hotel was really deep inside of village that it was very hard to find. They didn’t have sign board of the hotel. Even they gave me the room which was at the second floor of their house. Actually I saw there was another small house, but it looked like it was for the group. I was really embarrassed. They didn’t write that it was kind of B&B. I felt like I was cheated. 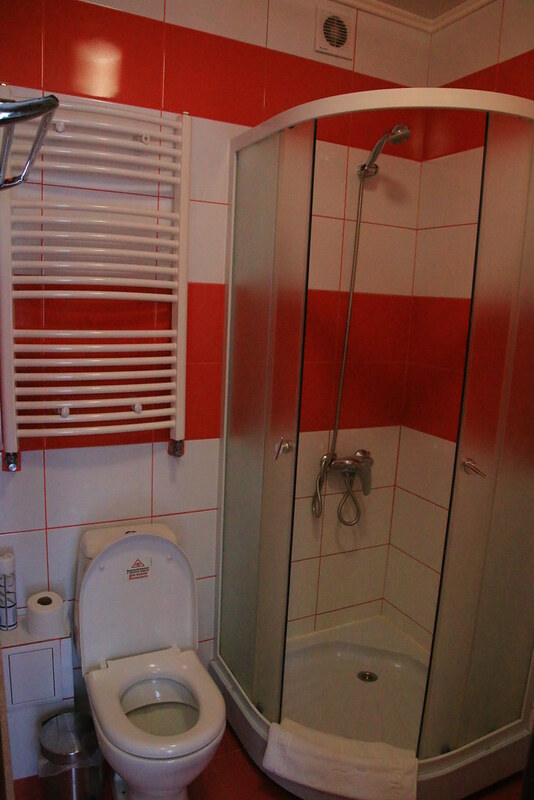 I paid for the hotel to have privacy, but here was not much privacy. However, family was kind…. Hm……. Anyway I took shower and dried wet cycling clothes. 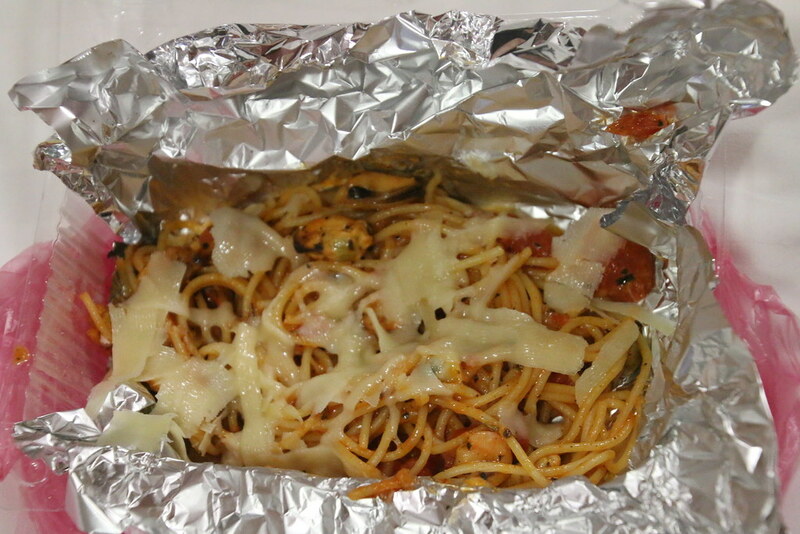 After that, I had dinner with leftover from the lunch. 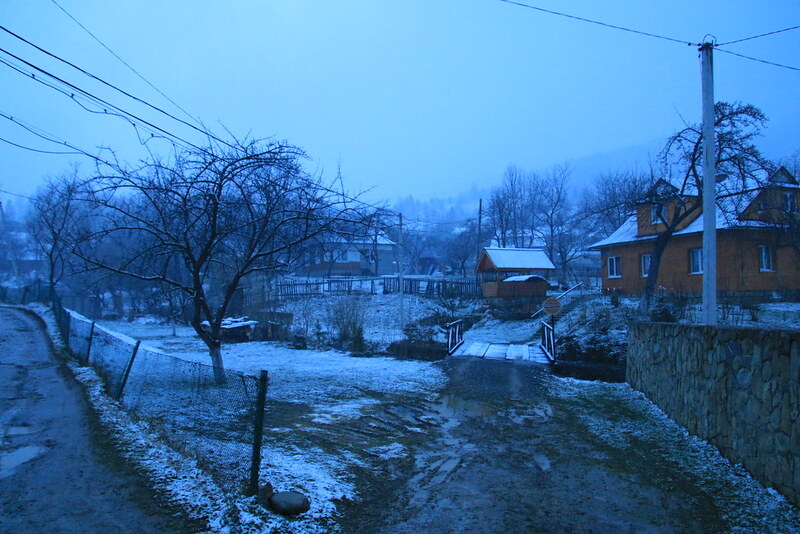 At the next day.. yup.. very normal day.. Snowing.. Beautiful April. The weather was crazy, so was I. Actually I was heading to the mountain area. Even I had to go back with my bicycle later. Total 100 km (62.5 mi) would be for coming and going. I could leave my bicycle at the city I stayed on the weekend, but I decided to come here with lucky. I didn’t like lucky had a free time alone. It seemed like lucky revenged as bringing snowing. I went a few restaurants but all of them closed. I found one restaurant when I was near my destination. 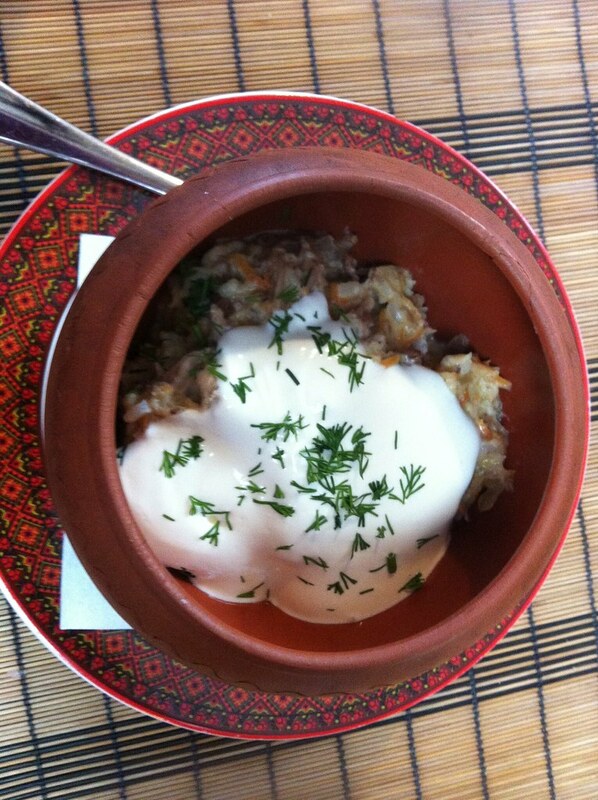 Again I ordered pot food by mistake which I didn’t like anymore. It was too greasy to me. 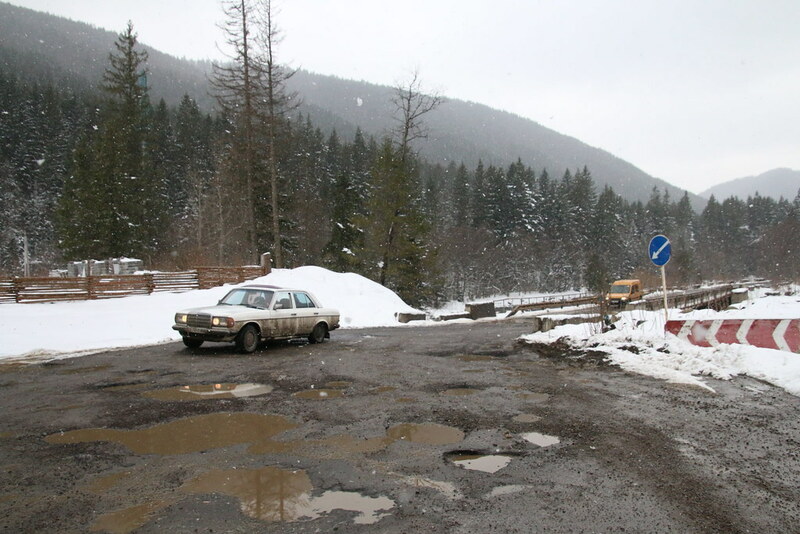 In my experience Ukrainian road was too bad. Yes, I was wrong. I turned around. By the way, scenery of wrong direction was really fantastic. Here was also beautiful. I felt so lucky to come here with lucky. It was really awesome to see the snow on Spring. I was so excited to see heavy snowing. 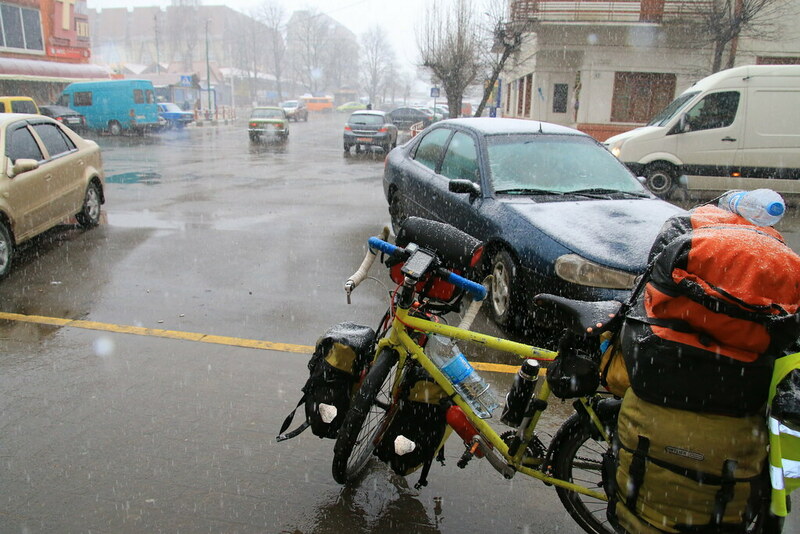 The best time for cycling was when it snowed. 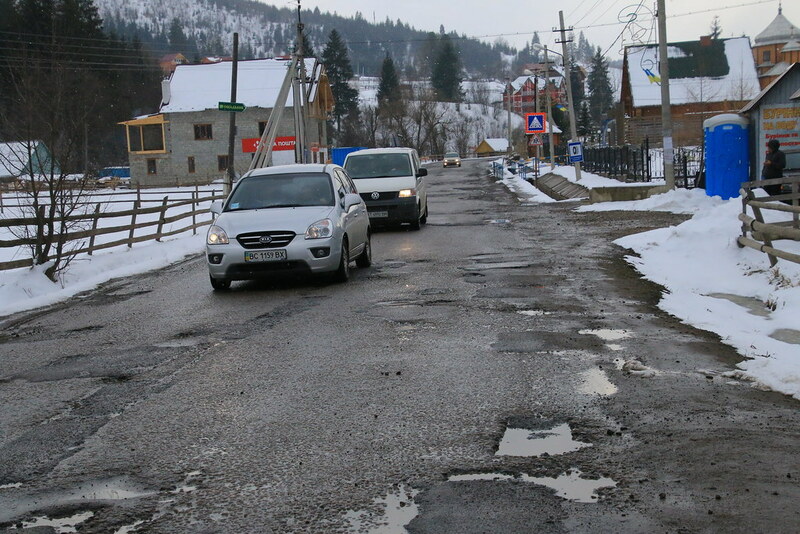 I took the picture of it to show Ukrainian road. There were so many holes everywhere. 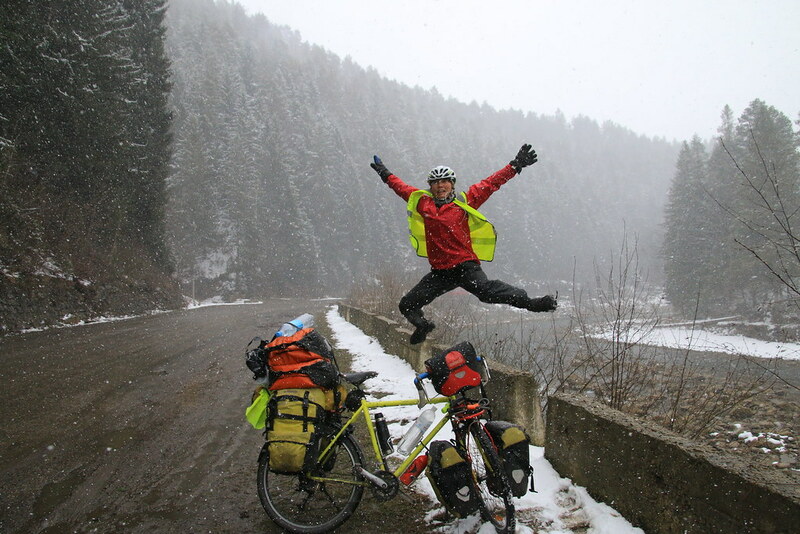 Ukraine is a big country, but I cycled on a very small part. So, I didn’t know how the other parts would be. But for sure the western road was the worst. Frankly speaking, it was worse than African countries’ road I’ve cycled. But I really loved this road so much. The reason I loved to cycle on the worst road was cars drove very slowly to avoid accident. It made me relax because there was no car passing so fast at the next to me. I also had to concentrate on the road to avoid falling off. 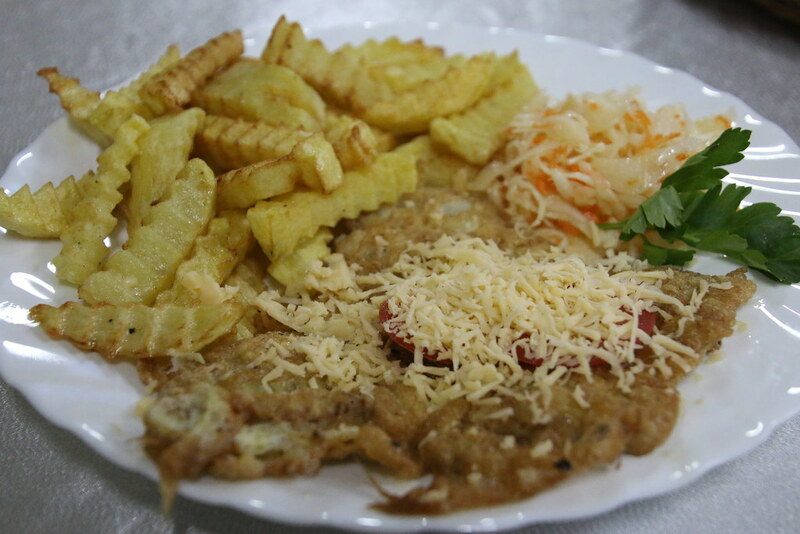 Yeah~~~~~ Here was biggest reason why I came to the mountain. The pink hotel was the one where I would stay. A toilet was very clean. I did love a clean toilet. Clean toilet gave me peace. I had a balcony. There was no other close building that I could have privacy more. Here was the story how I came to the mountain. 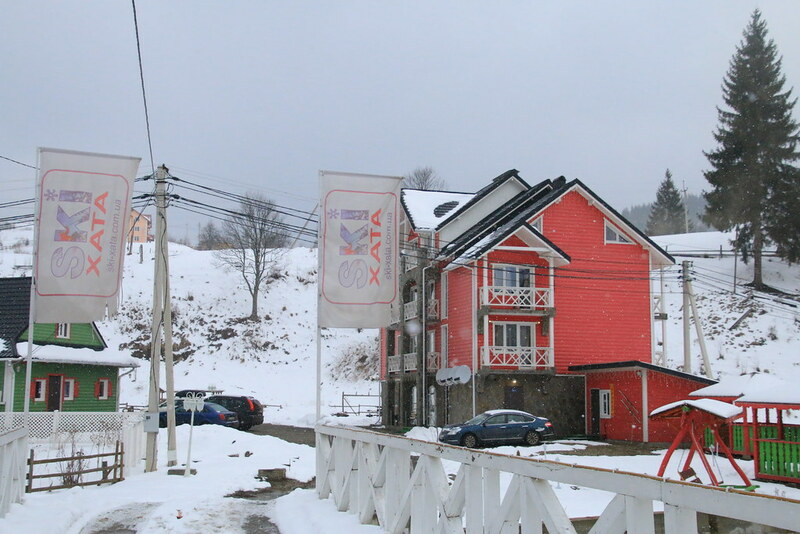 When I drank beer with local friends in Lviv, I told them my wish was to go to a ski resort. 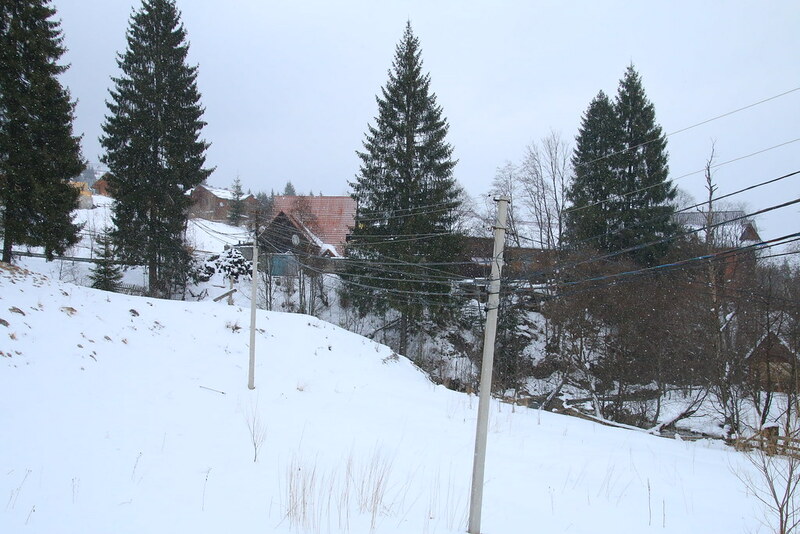 They told me there was a ski resort near Lviv and it would be cheap now because of slow season. I asked them to write the name of ski resort on my iPhone. 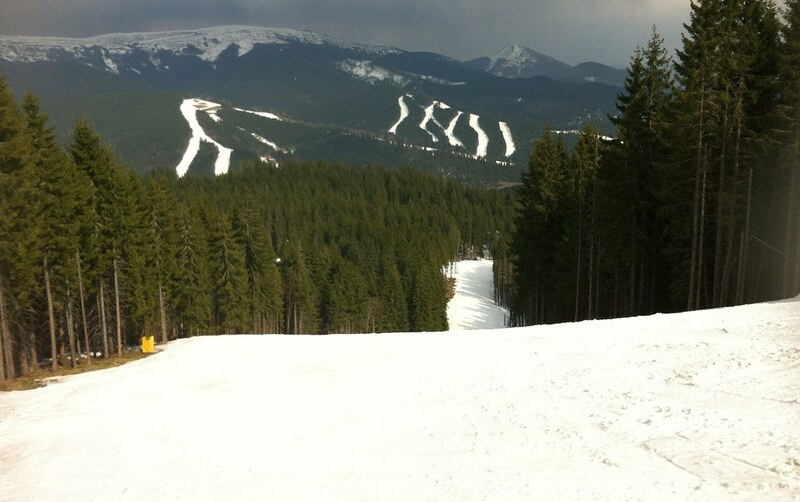 The name was “Bukovel”. I researched on online and I got shocked. 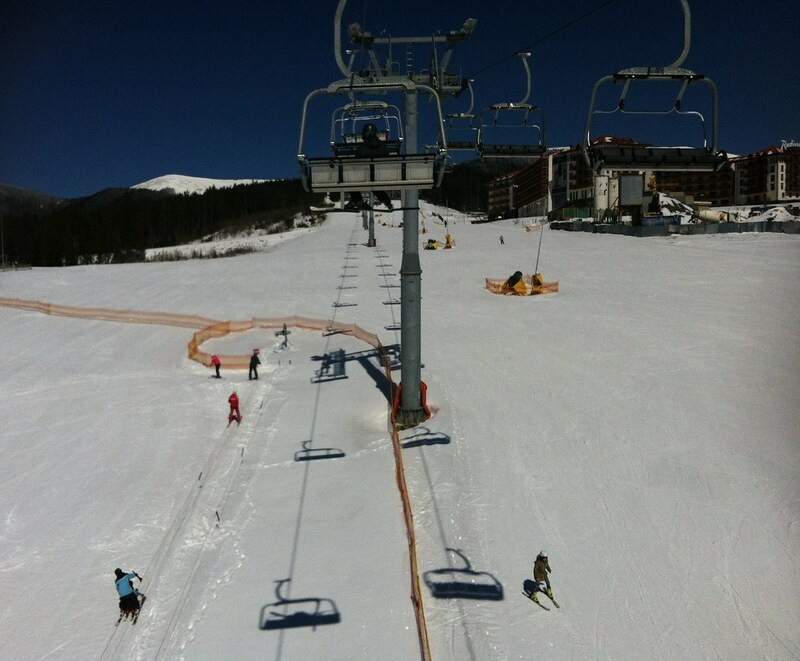 I checked Korean ski resort to compare and Korean ski resort was around 80~100$ for one day. Definitely it was chance for me here. Busy season was three times more expensive. 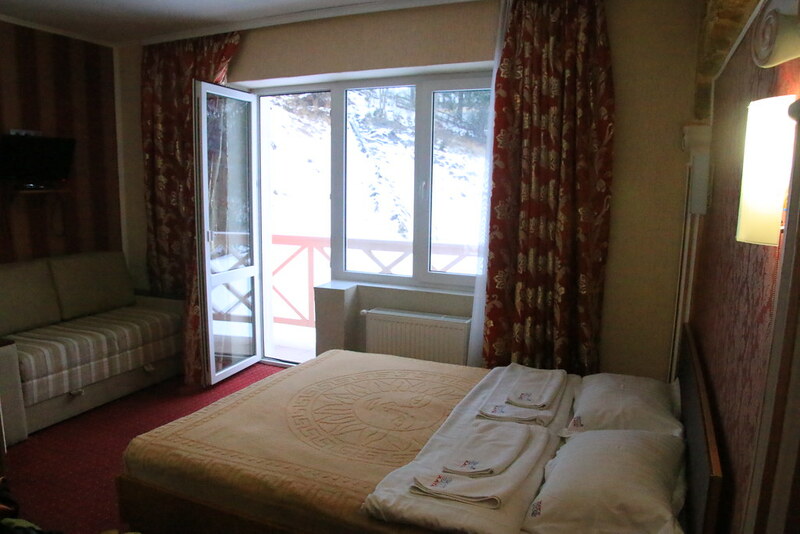 Hotel rented me ski for 60 UAH for one day (2.7$/One year ago 7.5$). I thought they gave me discount because I stayed here. When I checked the other shop, it was two times more expensive. While having dinner with them later, one of them told me he usually taught ski to his friend and even he could teach me ski tomorrow morning. Wow… what a lucky. 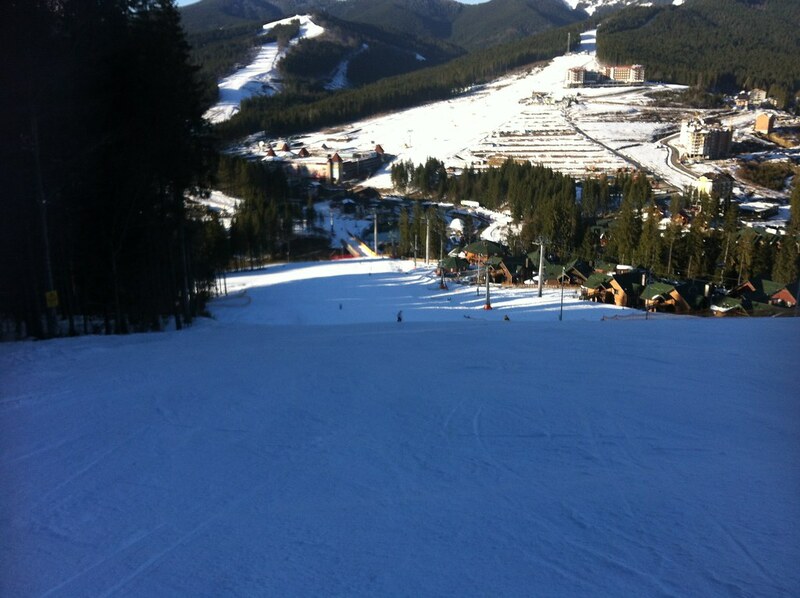 Actually I thought I could not go skiing tomorrow, because I had to find ski school. 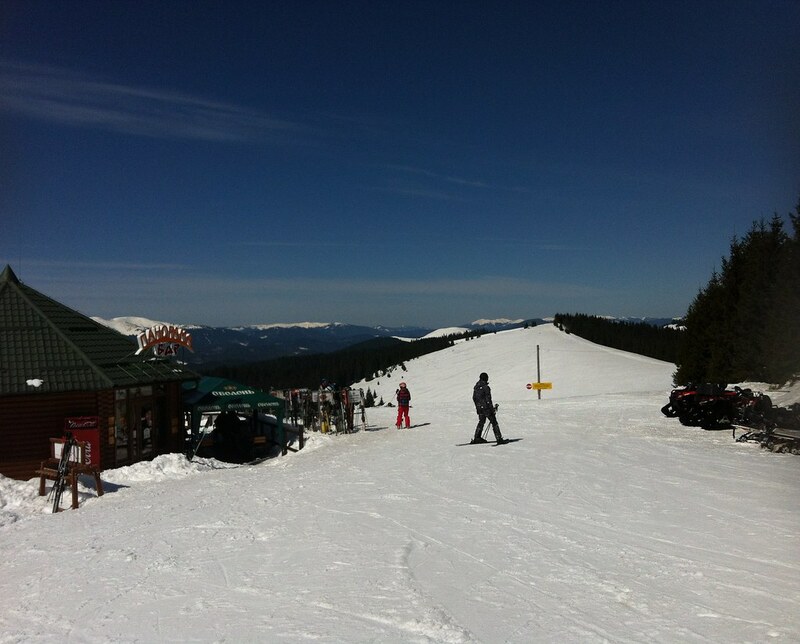 I wanted to learn snowboard, but it looked like it was not popular in Ukraine. 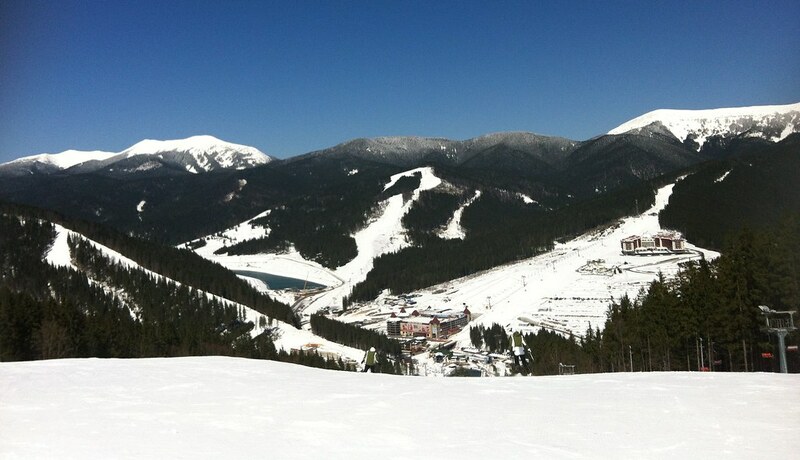 Anyway thank to him, Vitaliy, I could start to ski from the next morning. 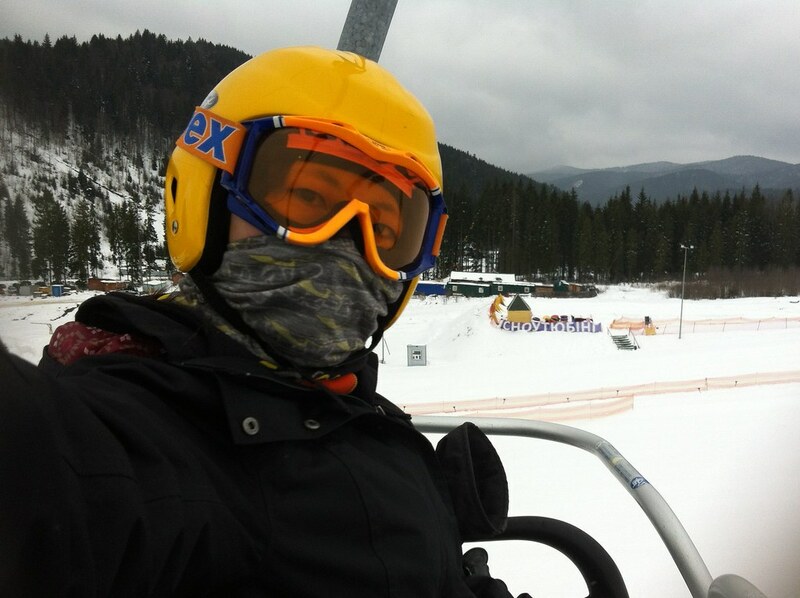 I chose yellow ski. Ski boots were too tight that it was very difficult to walk well. 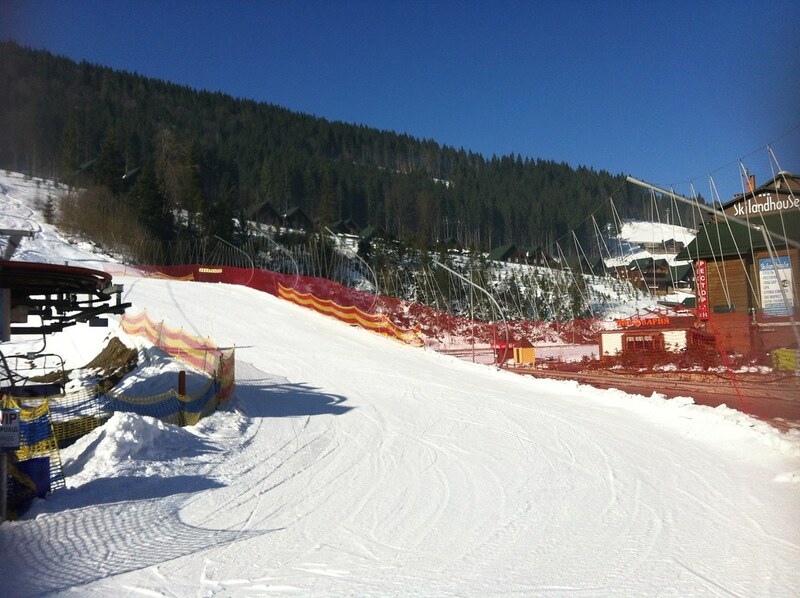 There was lift near the hotel, but I had to walk more than 1 km (0.62 mi) to get a practice slope. 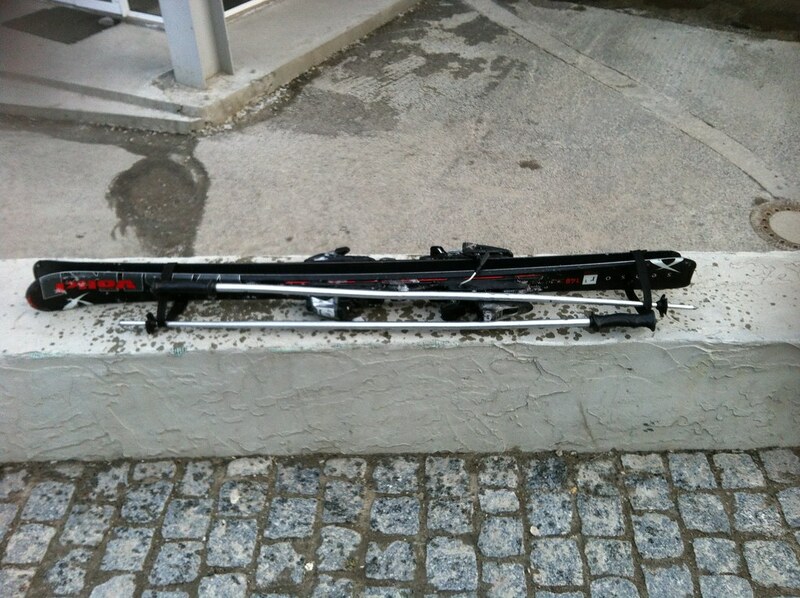 It was extremely hard to walk and my ski was too heavy. 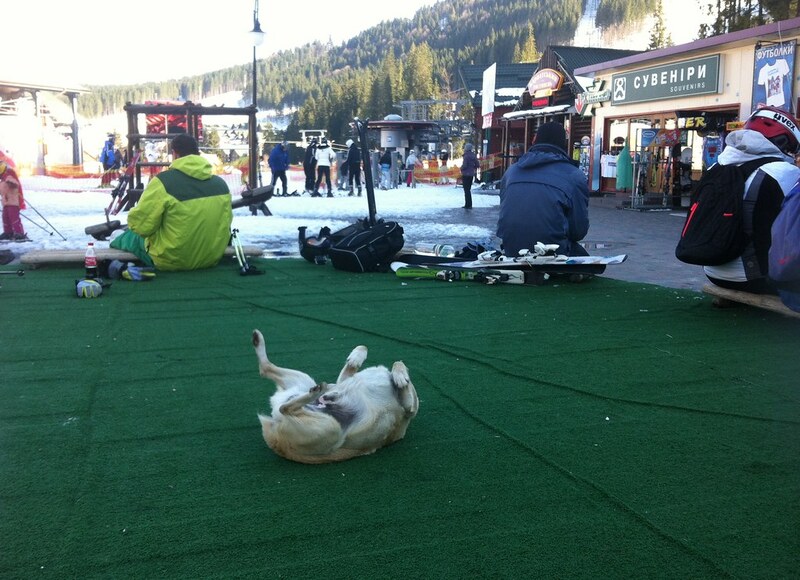 My romantic dream of ski was completely shattered. 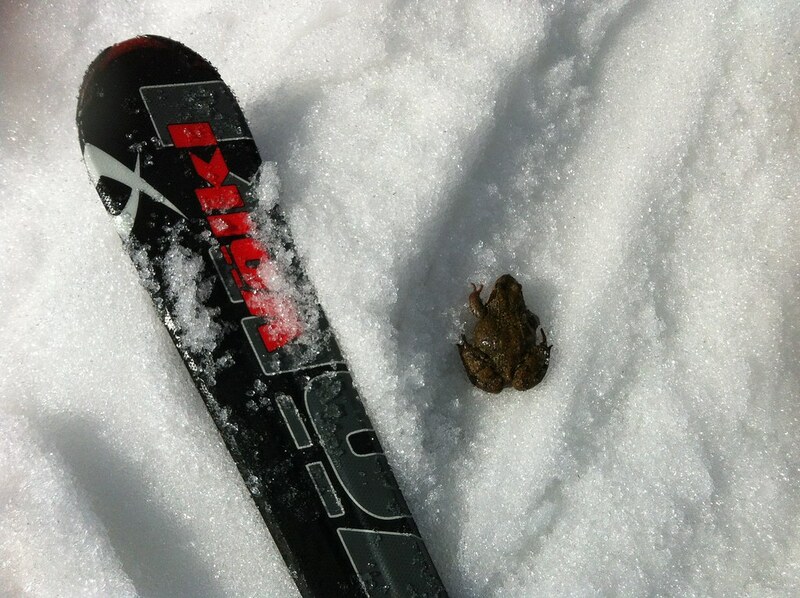 I was too slow ever that he took my ski to help later. The picture is from other site!!!!!!! http://blog.hansol.com/73 from here!! The picture is not mine!!!!!! He told me how to the snowplough turn. But actually it was very scary to move with ski. I became like babies who tried to stand first time ever with two legs in their life. Later I succeeded. 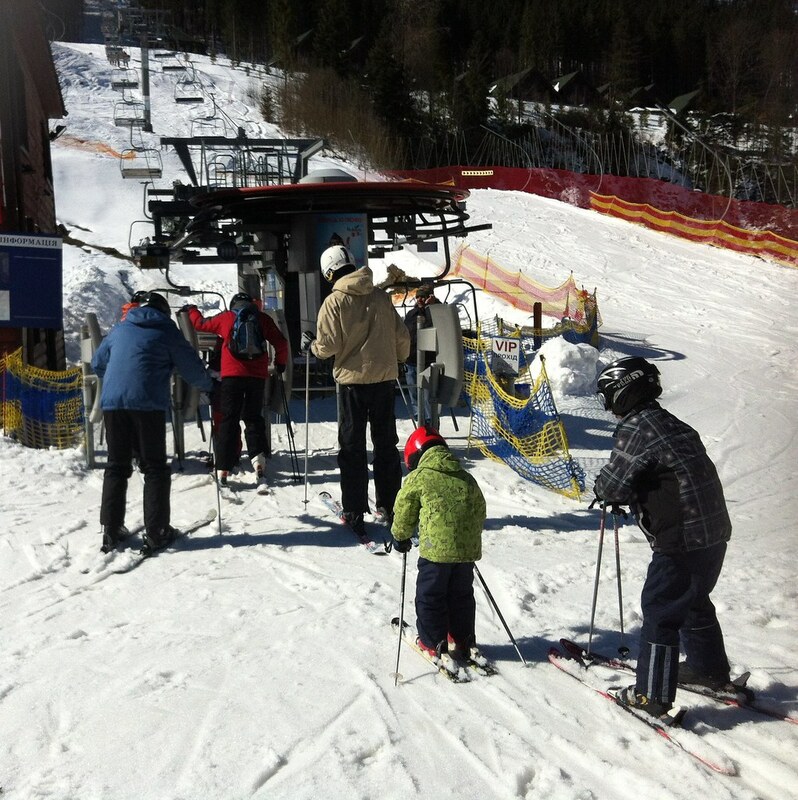 It was very interesting that I saw so many little children who skied very well. Once I got off from lift, I was being scary of a hill. I kept falling. After so many falling, I reach to the ground. After an hour, I became a bit better. I bought coffee to thank to him and we took some rest. He went to his friend and I kept practicing. 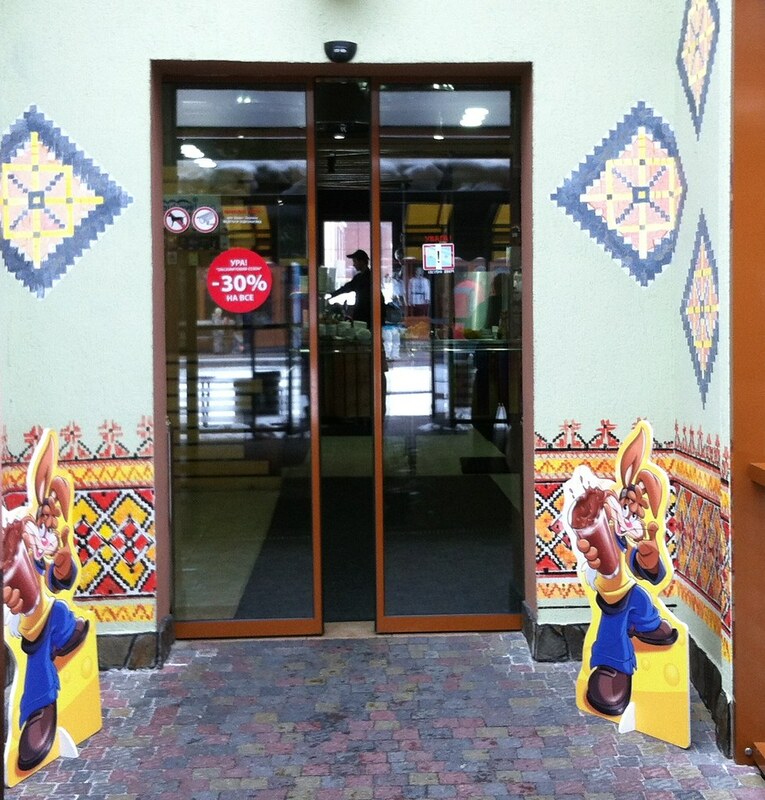 There was restaurant around lift 7 and there was a sticker of 30% on the door. Actually everywhere there was a red sticker, 30%. 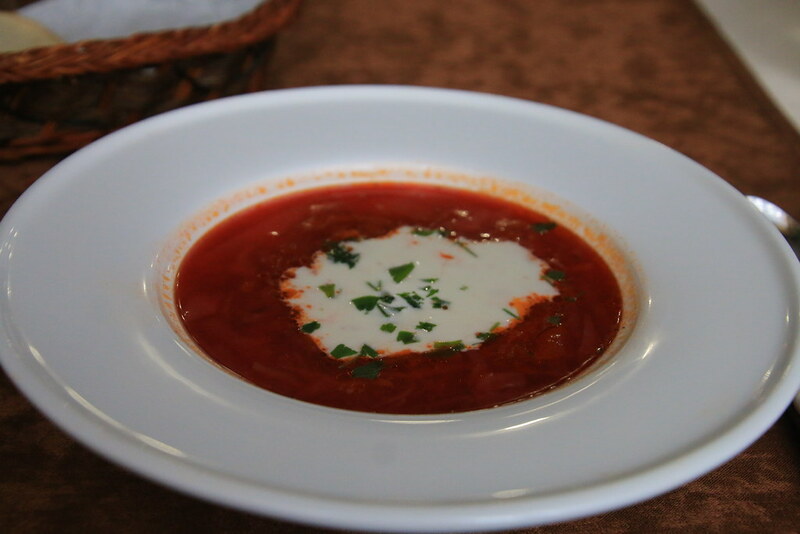 It was interesting to see even restaurant had 30% discount because of slow season. But actually it was not cheaper than other city. Also tasty was just so so. Yup, welcome to the resort. There were many street dogs and later I remembered many of them. I was very jealousy of children. How come they could do ski so well with that little body. In the world the fastest learner without hard effort was children for sure. 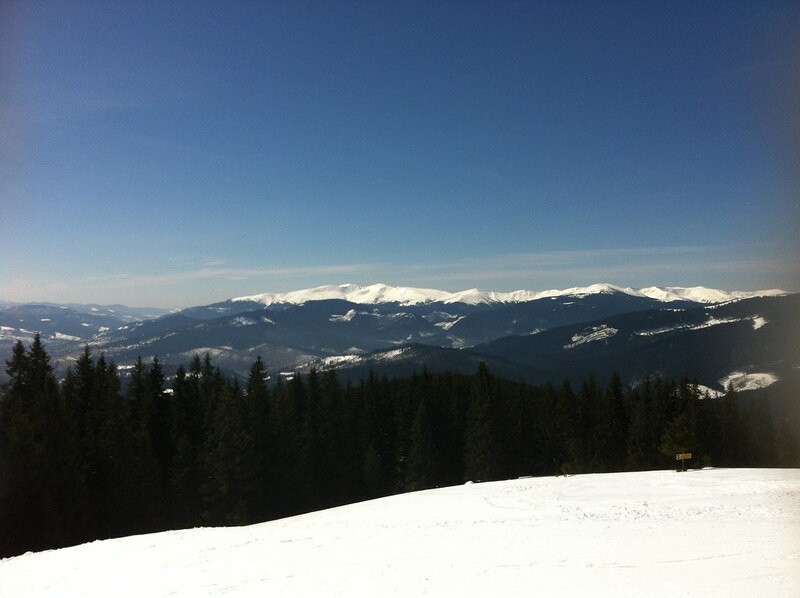 The name of resort was Bukovel. 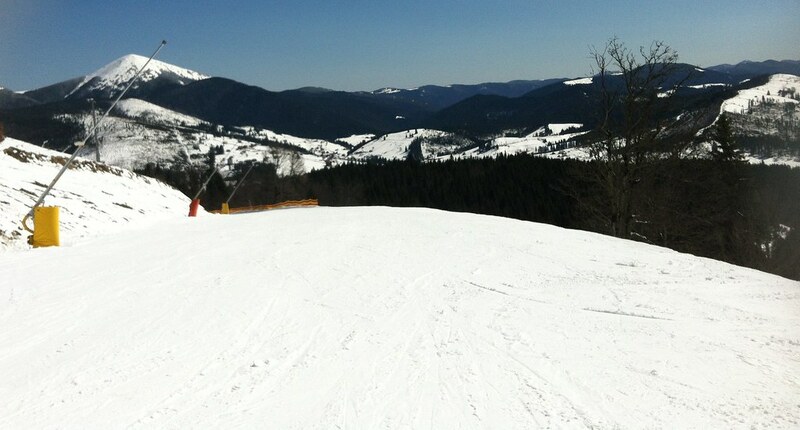 There were so many slopes and lifts. I checked Korean ski resort and there were only 10 slopes at every ski resort. 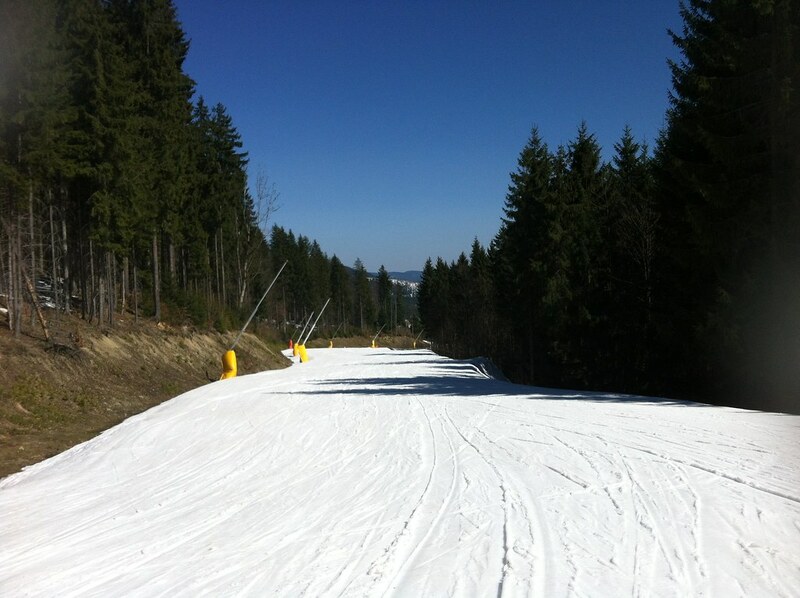 But here at least more than 40 slopes and 13 lifts. Definitely it was very difficult to find the way by myself with poor sense of direction. 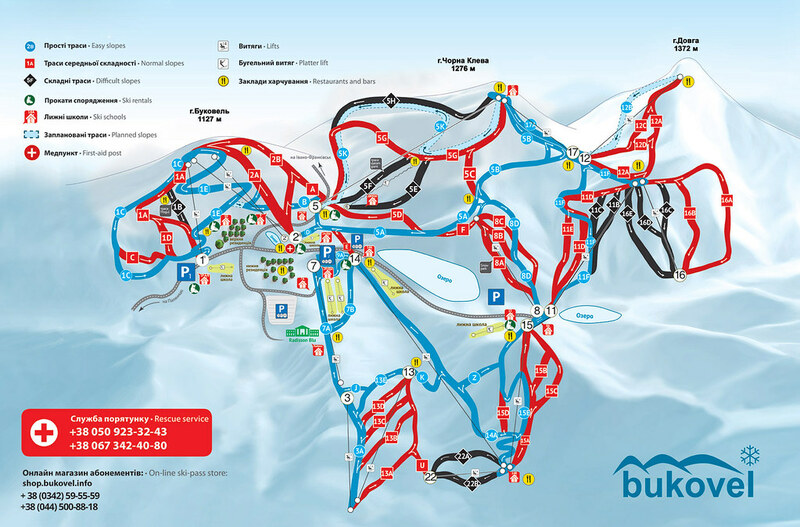 The map from Bukovel was not helpful to me. So I used offline map on my iPhone. I made this map from my offline map and put the direction. They only opened three lifts after 4:30 pm. One of them was just in front of my hotel. 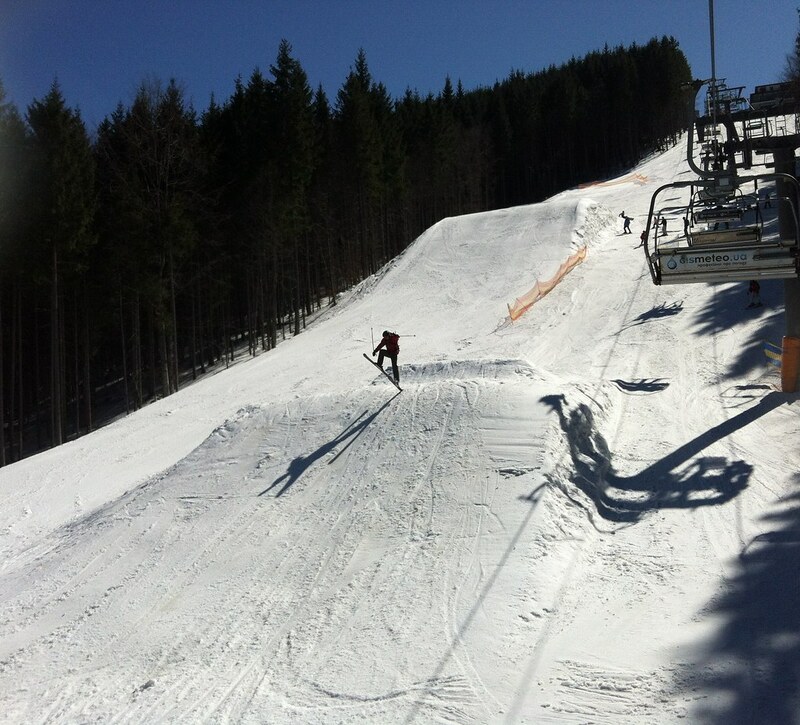 I just started to go skiing on a bit difficult one than a practice slope at the afternoon. But I had big pain with my knees. It was so painful ever. It was not because of falling, but maybe because of unfamiliar sports. I was not excited to get lift anymore because I was used to now. When I got off from lift and touched the ground, then I said automatically “Oh my knees”. It was really painful with knees. One time I took the lift with the security guy. He told me he saw me skiing and I was doing well. I told him it was my first day. He asked me I wanted to go to the other slope where he was going. I asked him it was for a beginner. He told me I could ski over there. So I followed him. And it was the hell. 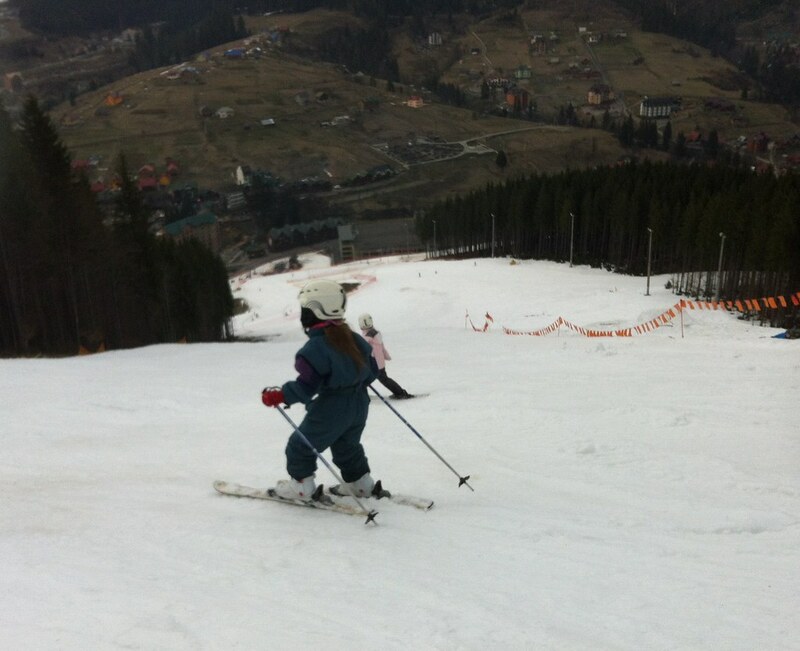 It was too steep for me, a beginner. He already went away to work. I skied with the speed I could not control. I was so lucky that I didn’t fall. I thought he was so bored and wanted to work hard. That’s why he brought me here. But he failed to get a good job from me because I survived. It was really surprising event. 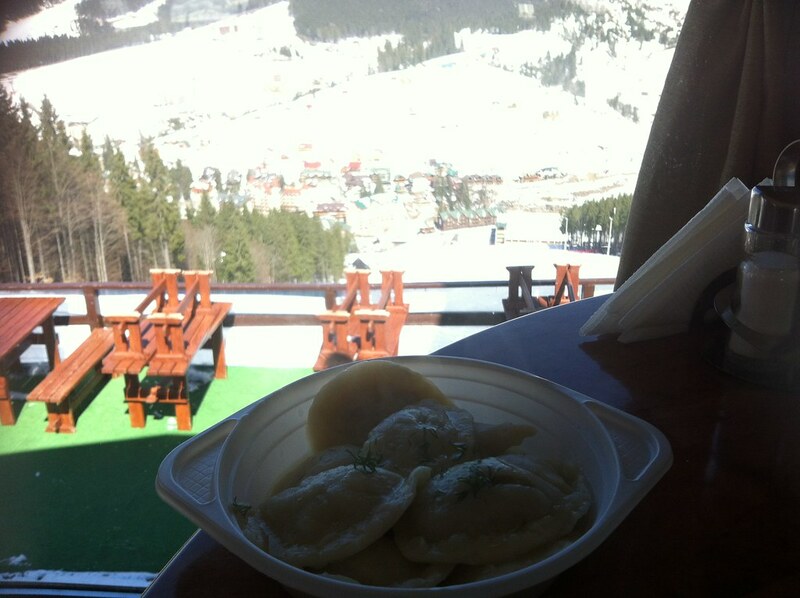 I didn’t know I could come to ski resort during trip. The advanced slope looked really steep ever that even I could not see well. It was really mystery to see how people could ski here. 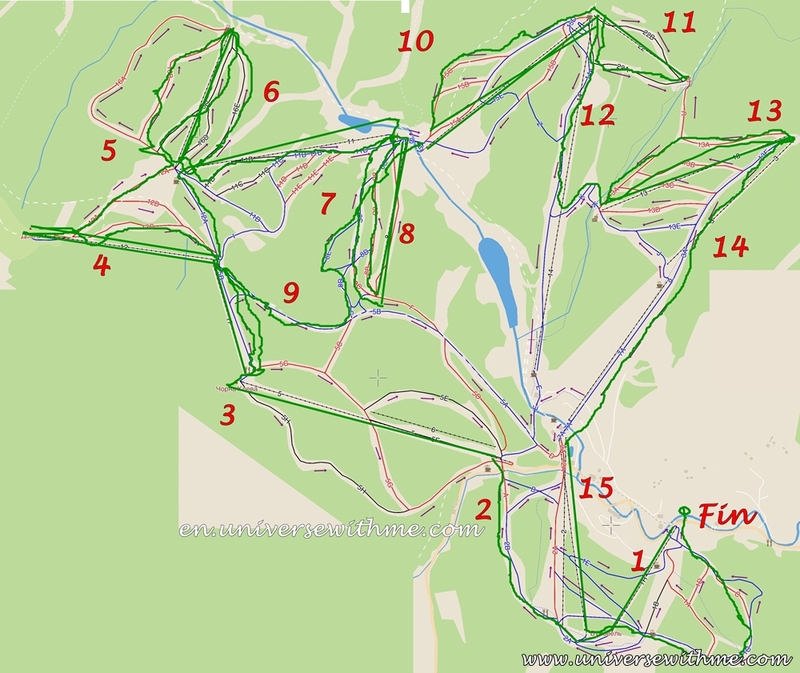 Disadvantage of lift 1 was that I could not go to lift 7 where a practice slope was because there was only intermediate slope to go to lift 7. 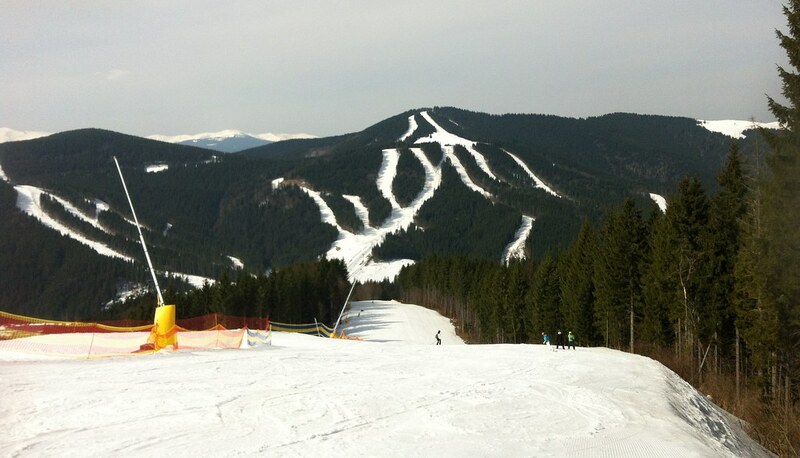 The weird thing was on Bukovel map, this slope was for a beginner. But on my offline map it was for a intermediate. 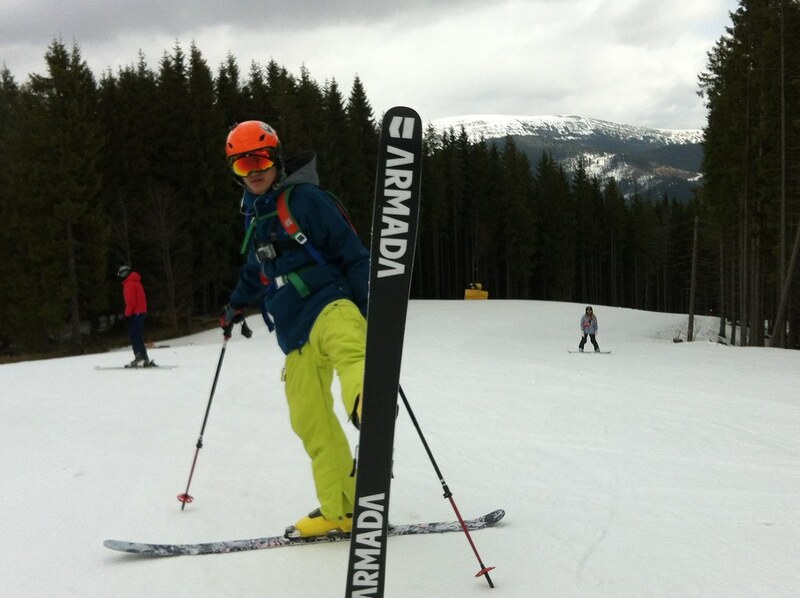 I didn’t want to walk with my heavy ski to lift 7, so I decided to test this slope. And it was the hell of the hell. 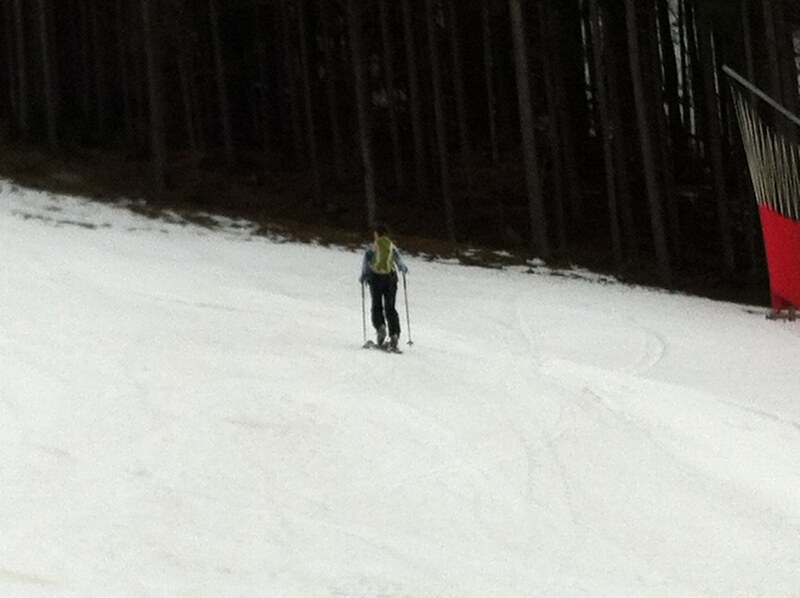 I could not ski because it was too steep for me. I fell almost over 20 times to get to the ground. Lucky that I was not injured yet. Break time after hell of hell hard time. I was curious how dogs went everywhere. The left one was really for a beginner, but I didn’t start there. 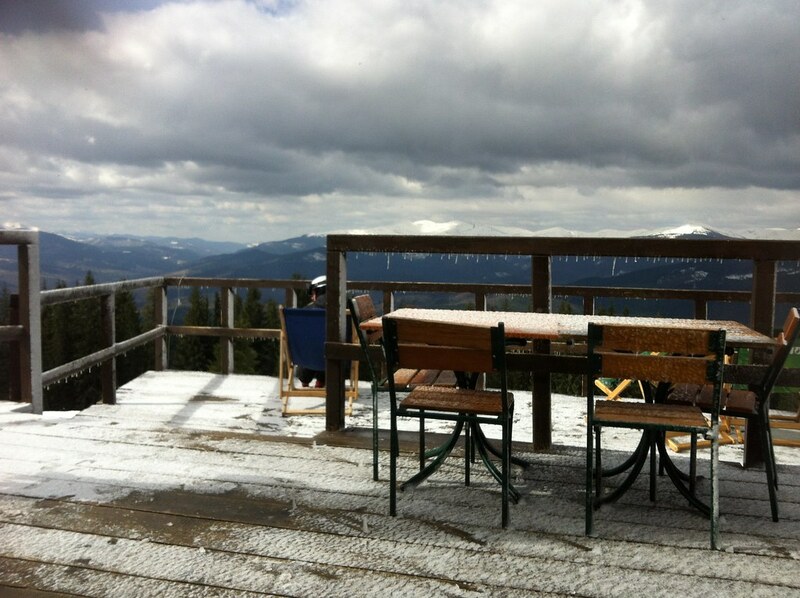 By the way all of picture on ski resort was taken with iPhone4. Just in case I fell badly, I didn’t want to carry my Dslr. 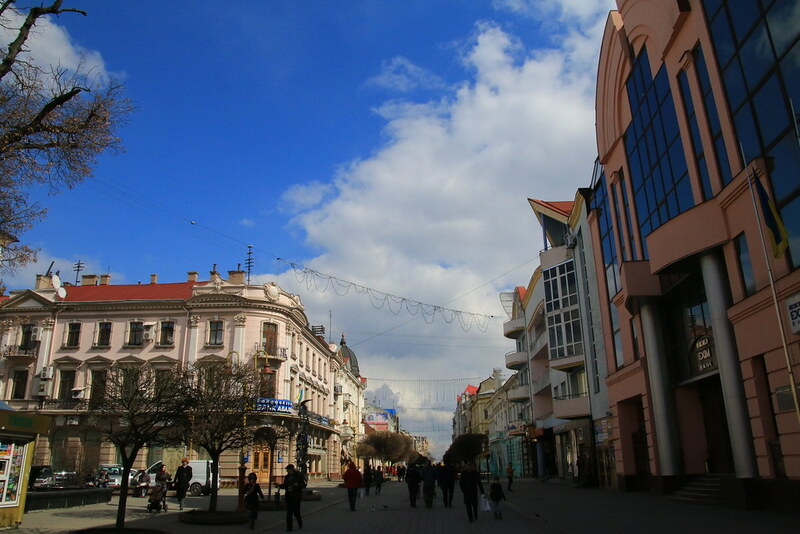 From the second day, it was very sunny and snow melted. I didn’t wear ski clothes. All of my clothes were from Decathlon which sell cheapest sports gear. My clothes were cheaper water wind proof. But it really worked perfectly. 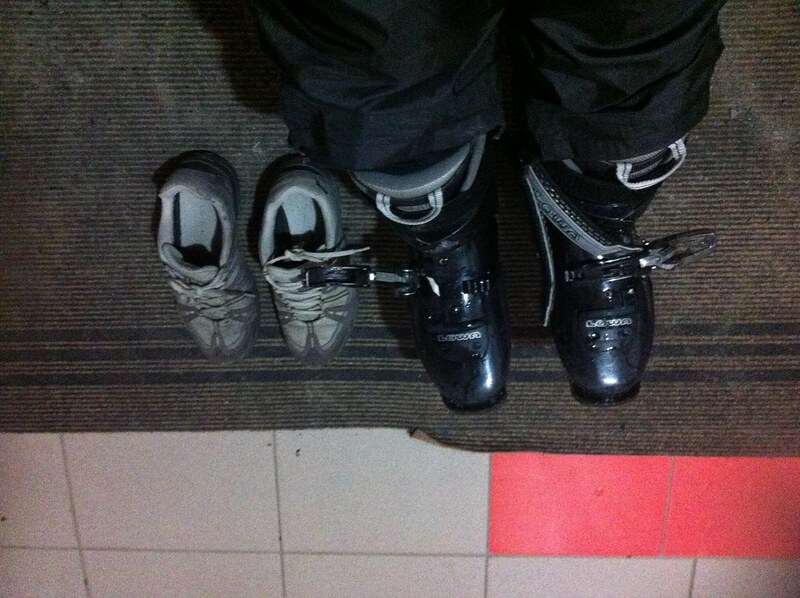 I changed ski boots today and it was much better to walk. It was too warm that the snow was more like sand. 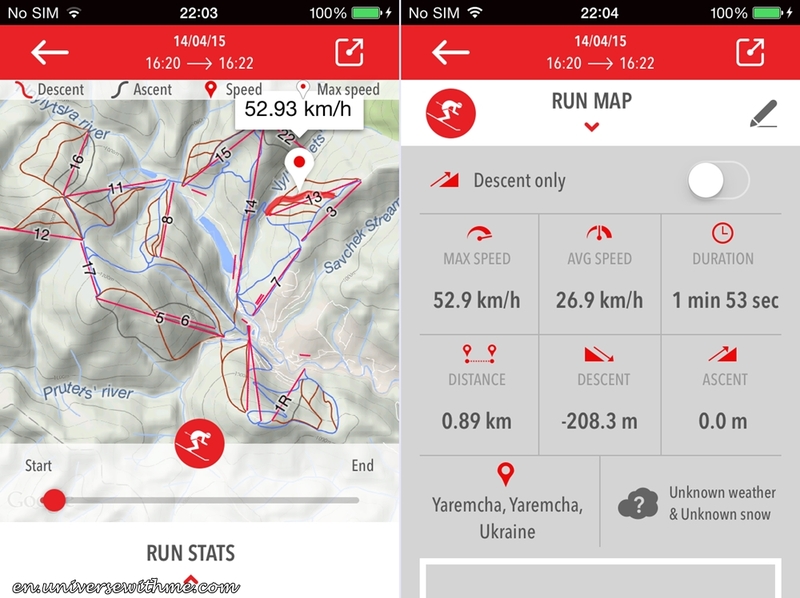 I could go from lift 7 to lift 2 at the first day, because it was a bit downhill. 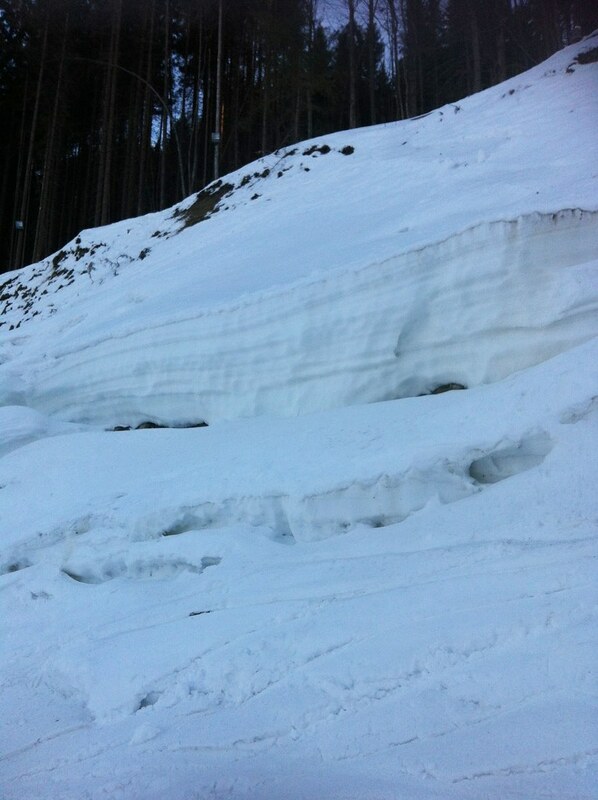 But from the second day it was hard to go because snow was too smooth. 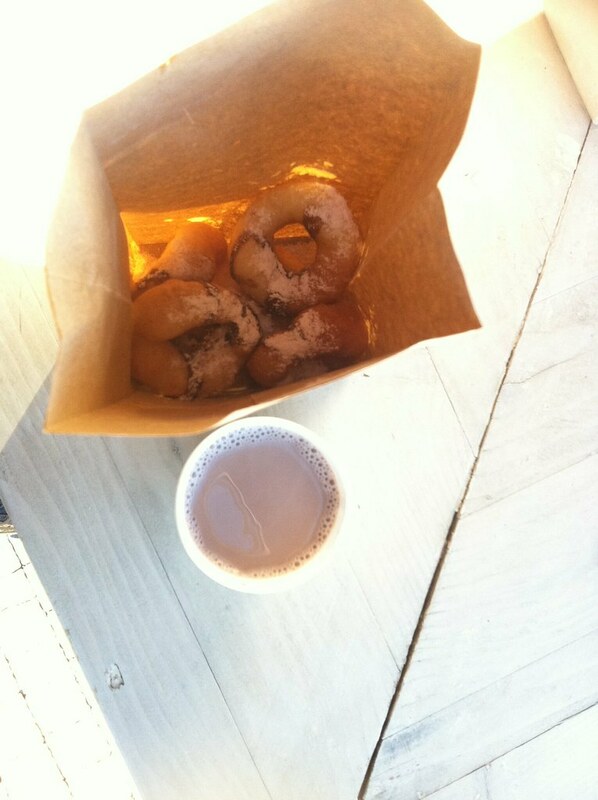 There was some kind of square that I bought donuts and cocoa. I bought it almost every day. 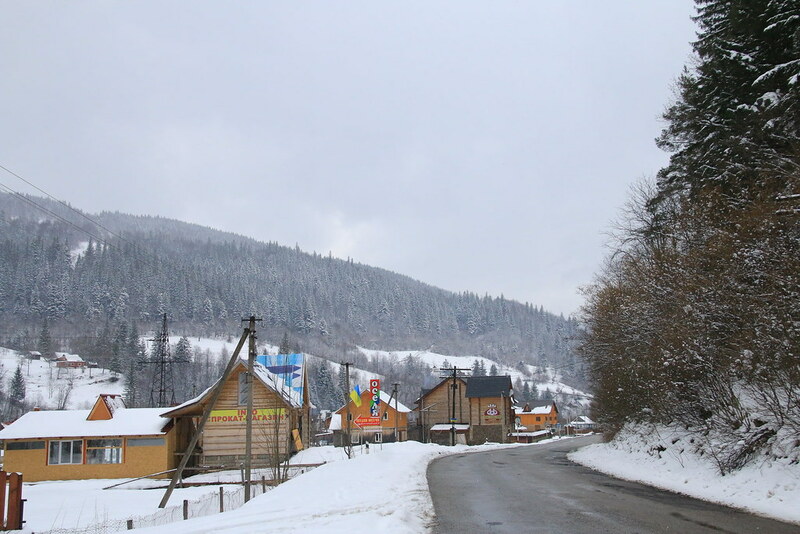 At the first day everything was covered by snow, but there was less snow now. The dog was dancing on the picture. I was curious that they were fine to go skiing here. There was reason sky resort was cheap now. I could see the ground even on the second day later afternoon. Yup.. Injured person.. 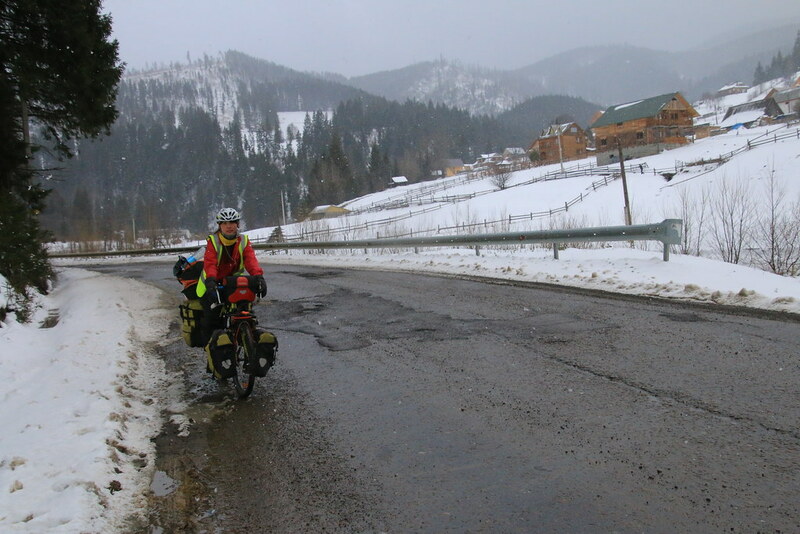 I was a bit scared to ski, because I should not get any injured to cycle. 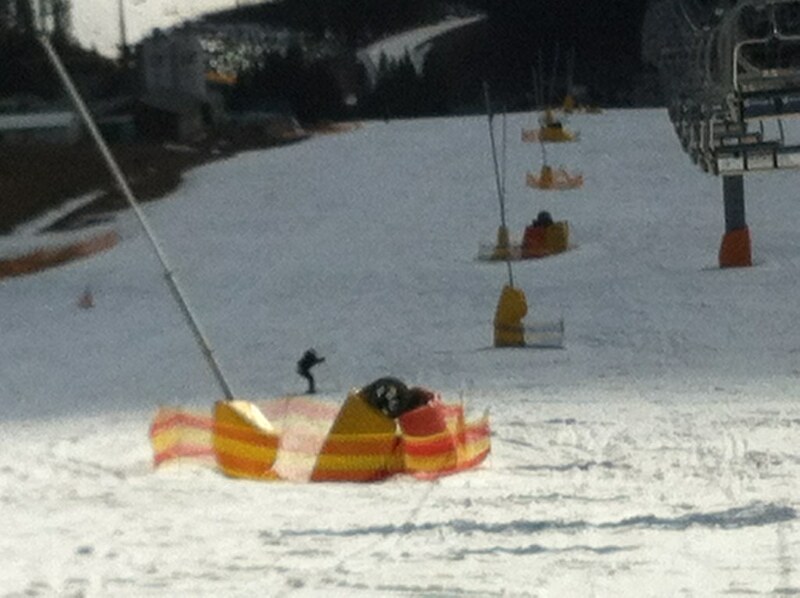 But I realized after falling over dozens of times, I would not get injured easily. Anyway I tried to be careful. The worst slope was the bottom of lift 1 at late afternoon. It became really like sand on the beach that it was too bumpy. Many of people fell here. I also fell here all the time. 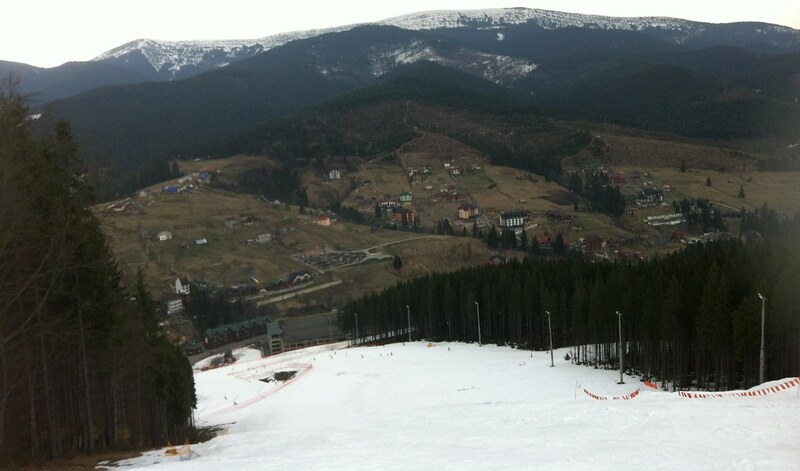 I told my instructor, Vitaliy, that this slope was the hell of hell. He told me he didn’t have any problem here. At the afternoon he taught me different position, Parallel turns. It was much difficult that I could not do well. He asked me why I could not do it. That was my question I wanted to ask, why I could not do it????. I didn’t know…. He told me that the most important thing was I must know how to stop whenever however fast. I should ski at the speed I could control. He emphasized If I hit the people from the back, it was my problem because I could not control my speed. He told me Snowplough turns would not work if I go faster, so I should practice more Pareller turns. He was really a good instructor! At the next morning hell of hell slope was covered by snow. For morning it was not hell of hell slop. Always in the morning slope was like this. When I saw the ground in the morning there was lines. I guessed it made of ski car. The people who skied very well told me they loved this lines. But as a beginner, I really didn’t like it because it was hard to turn. I felt like I would be stuck by this line and fell. 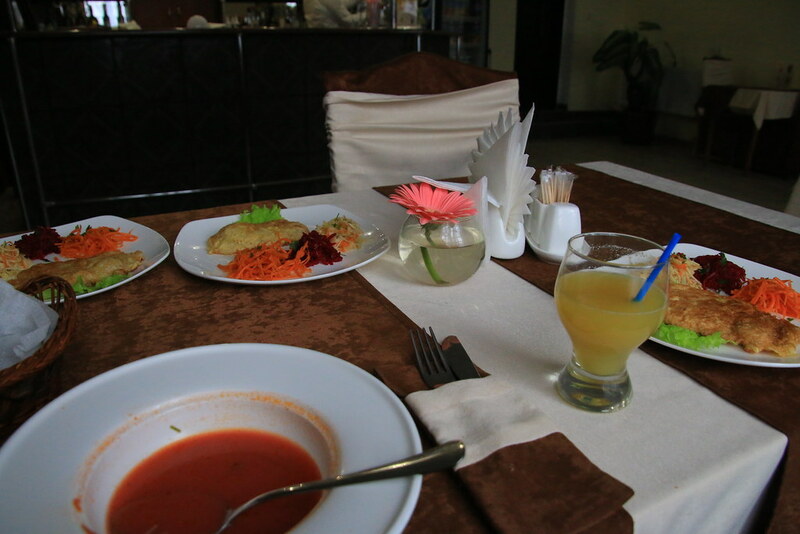 I was a bit having problem in the restaurant because there was no English menu. One local guy came to me and helped me to order some meat. And then………………….meat was on the pot… pot food ……..again……..no……no……..no more food on the pot……!!!!!! My translator joined lunch. 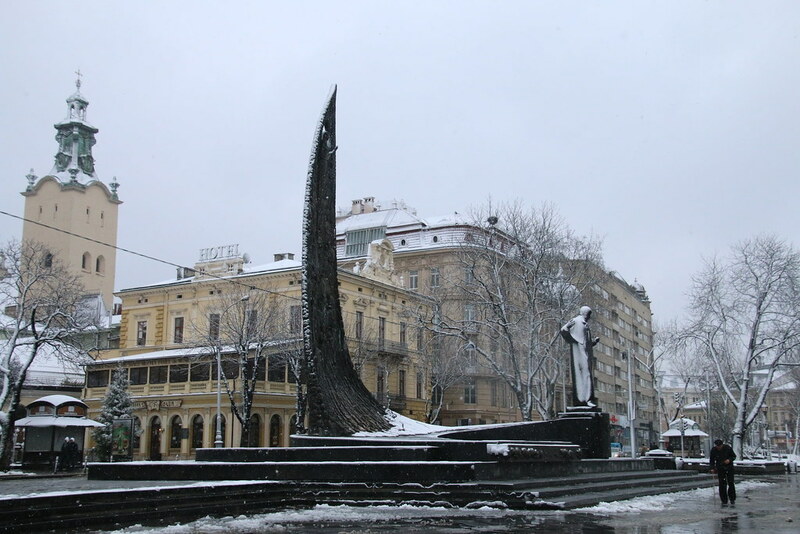 His name was Ivan and from Kiev, the capital of Ukraine. 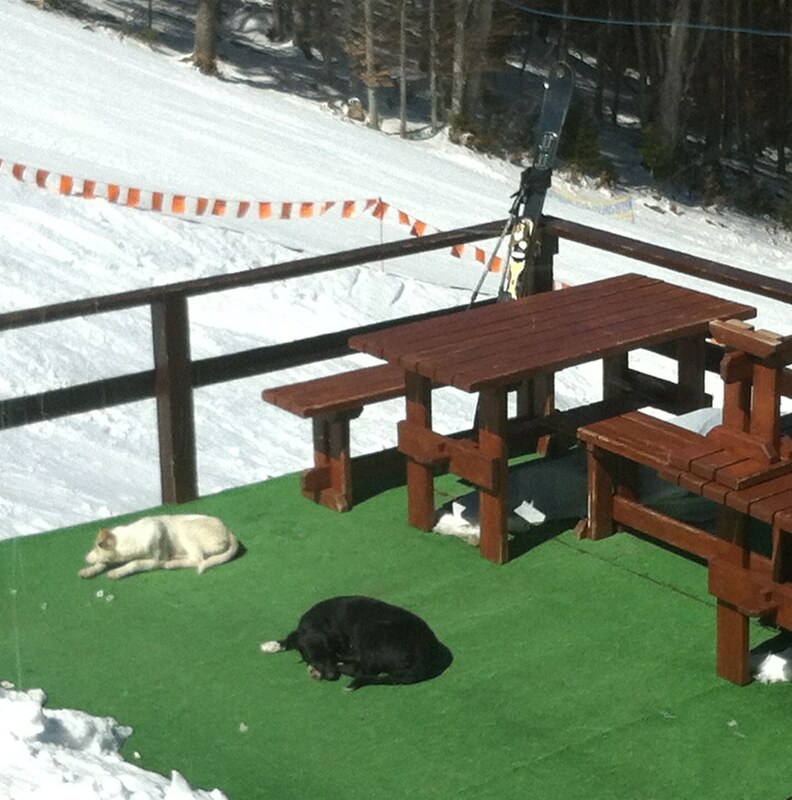 He did skiing since little child and even he worked here for three weeks as an instructor a few years ago. He ordered some interesting local food. From the morning my body condition was not good. I didn’t feel good after eating greasy pot food. 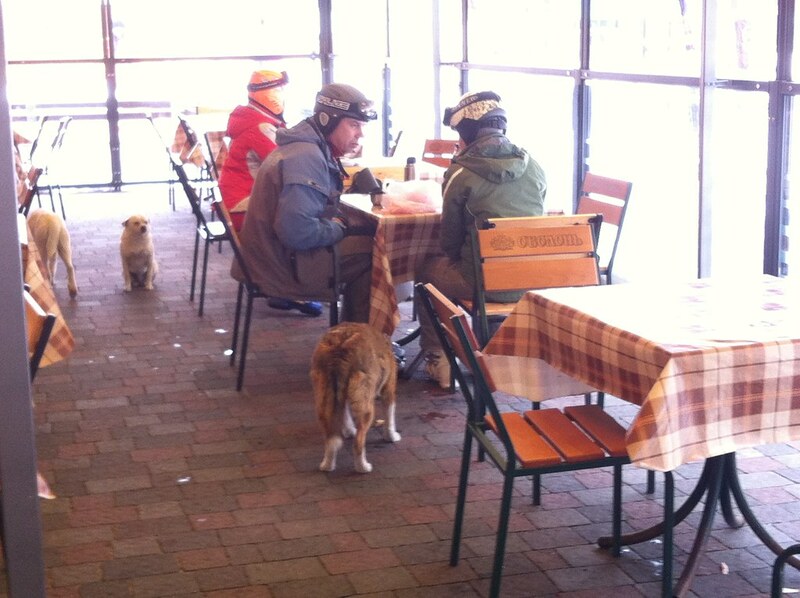 There was a beginner slope around the restaurant that we skied together. He suggested going to intermediate slope where the highest point was. 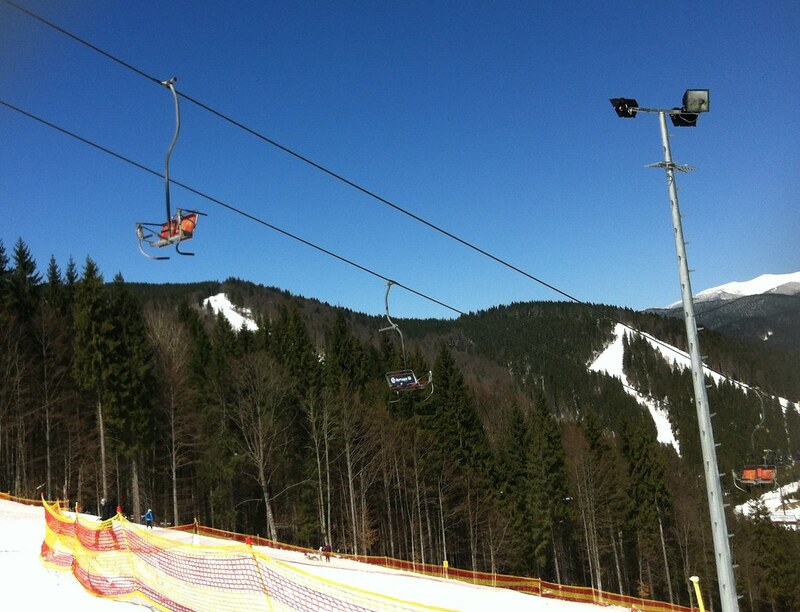 I had really hard time yesterday on the steep slope that I was afraid of going. But I wanted to see different scenery that I followed him. 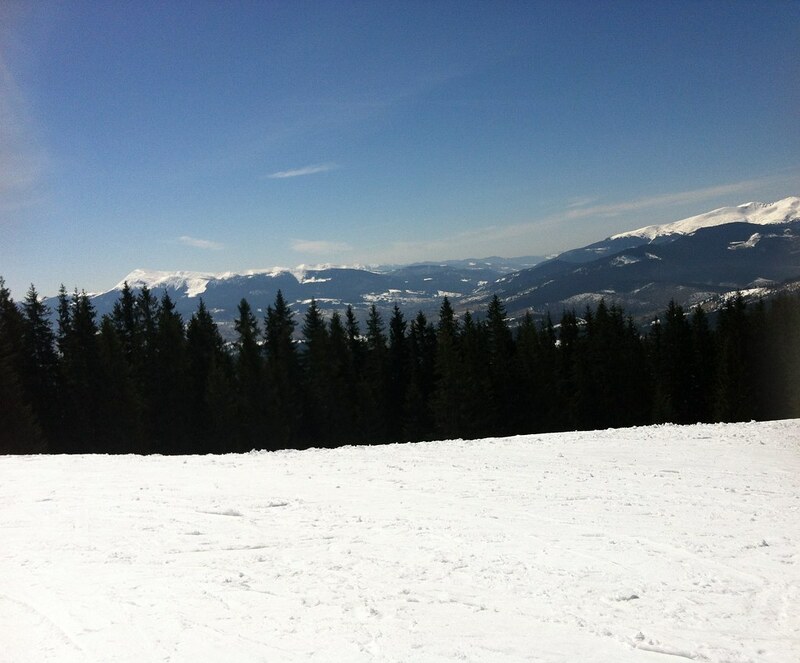 Thank to him, I could come to the highest mount, lift 12. Until this picture, I didn’t know what was waiting me. Thank to him, I could finish intermediate slope. 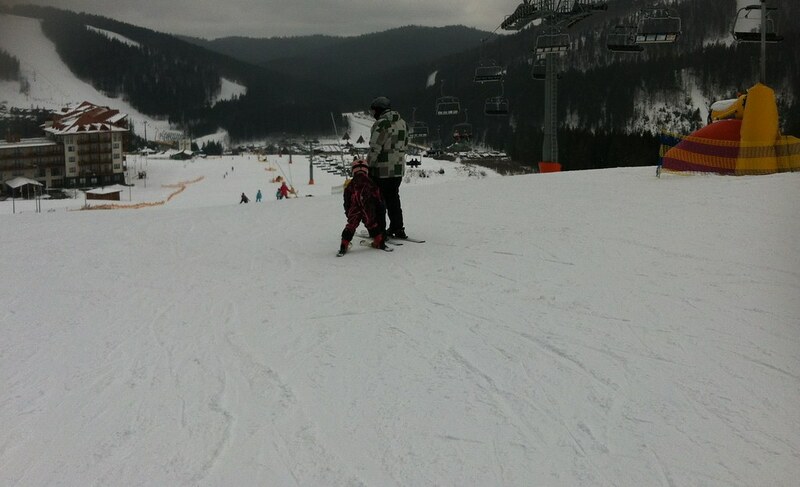 We went skiing on a beginner slope again. We decided to go to the other slope. At some point, I missed him and I could not find him. I became sick and I gave up finding him. I went to life 5 and life 1 after taking the rest on the square. But I could not stand anymore that I decided to go back to the hotel. 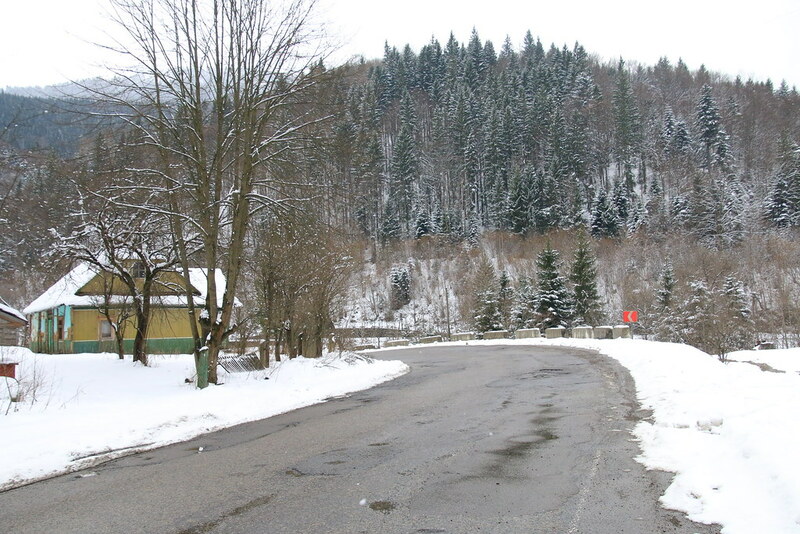 When I took off skiing and walk, I could not stand anymore that I vomited on the road. I thought nobody saw me. Since 8~9 years old, I was used to vomiting. Korea had really worst thing in a school that the principal made all of students stand to playground at two to four times a month in the morning. We had to stand outside on the playground and he had speech. Believe me I’ve never ever remember any of single speech. It was the most useless culture which came from Japan or military period. I had problem to stand in one place that almost every time I vomited after it. I was too shy to say to teachers ‘I am too sick to attend’. I less vomited since 13 years old. I didn’t know what the problem was and still I don’t know why I could not stand in one place longer well. If I stay in one place I felt uncomfortable with stomach. I had problem almost every time in the museum in Europe. When I have a headache, stomachache, cold, or whatever, at the ending what I see was vomiting. The only way to get better was to sleep all day without eating. On the way back, I met my teacher, who was going home. I said thank to him. I slept until next morning without eating from the afternoon. At the next morning I got better. I checked the facebook page and saw one message. It was from Ivan. Yesterday we didn’t have time to exchange number because we missed each other. But here I got the contact. How come? It was so easy to be found on google. There is no any Korean girl cycling alone around the world, who writes the blog in English ever. This was the reason I should not do any bad thing. Lol. 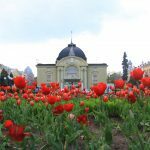 I gave up my privacy since writing blog. 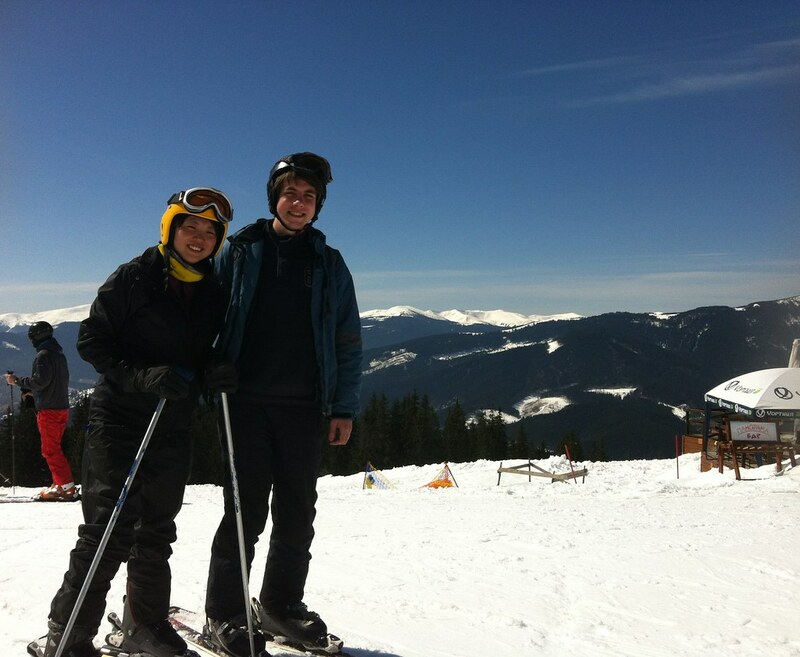 At the morning I had met Ivan again and we skied together. At the afternoon he went home, Kiev. 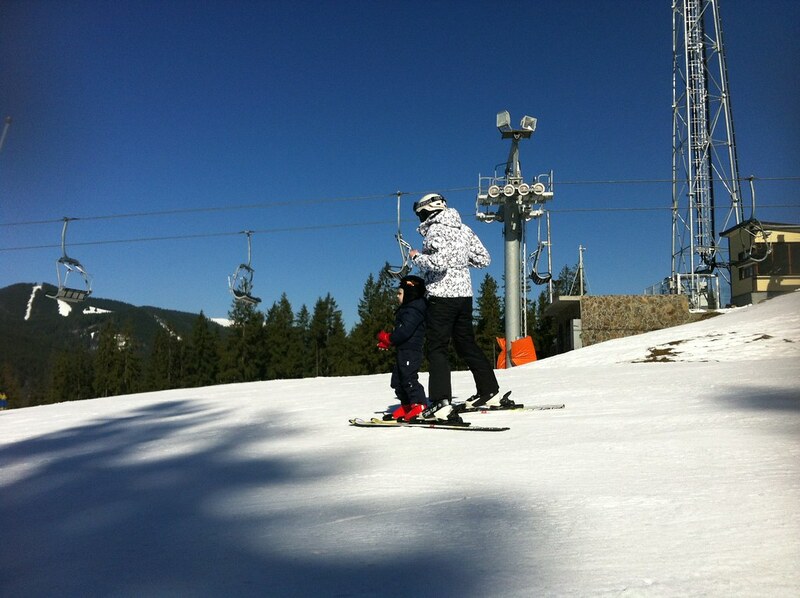 He also taught me how to ski well. 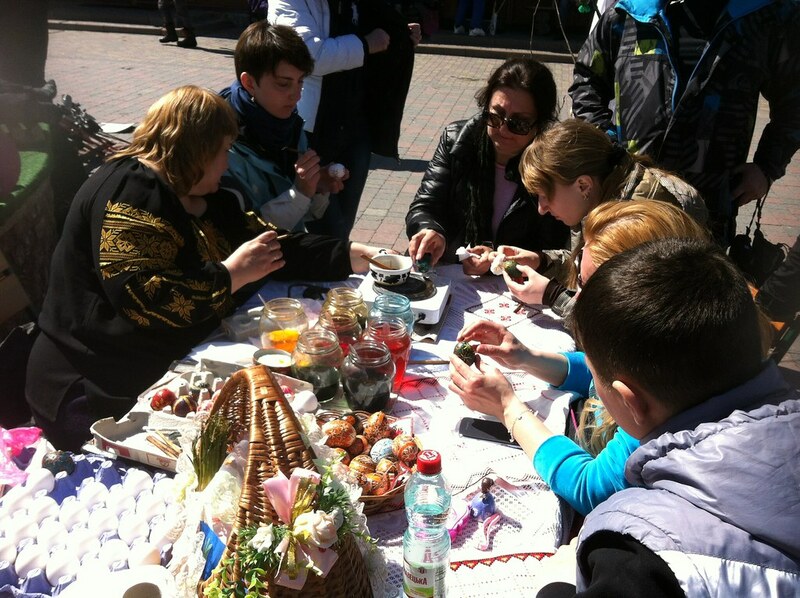 There was some even at the meeting point for Easter. The baby looked so cute ever. 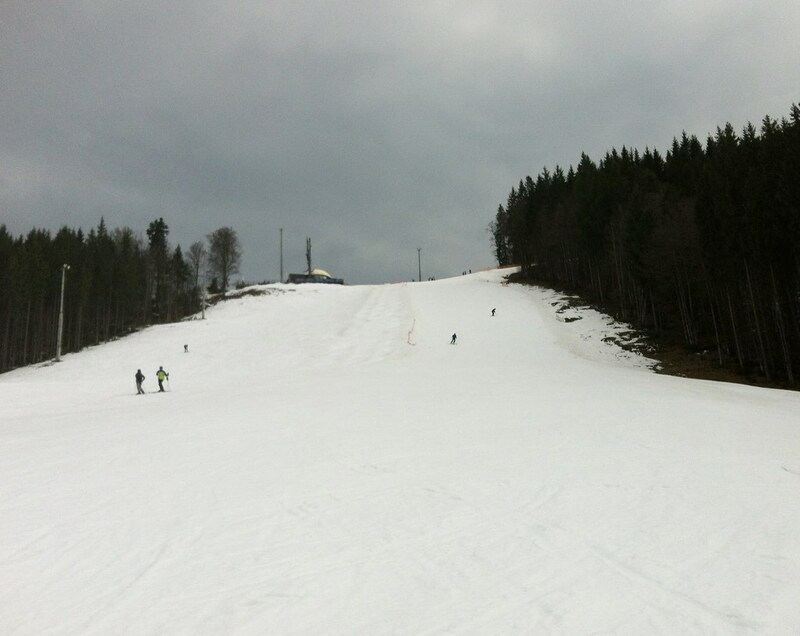 I tried to ski on an intermediate slope and it was a bit better. I had realized that Ivan helped me lot yesterday. Actually it mattered of fear. I overcame fear of steep slope. 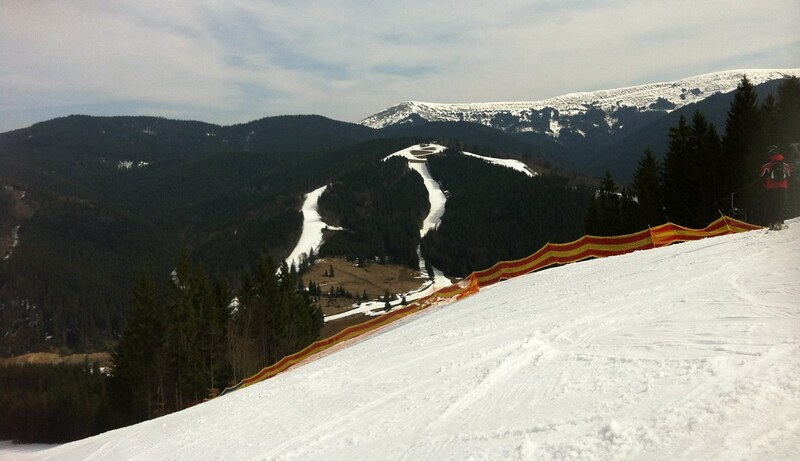 From the fourth day, I could ski on intermediate slope. It was good decision to not kick Ivan yesterday. 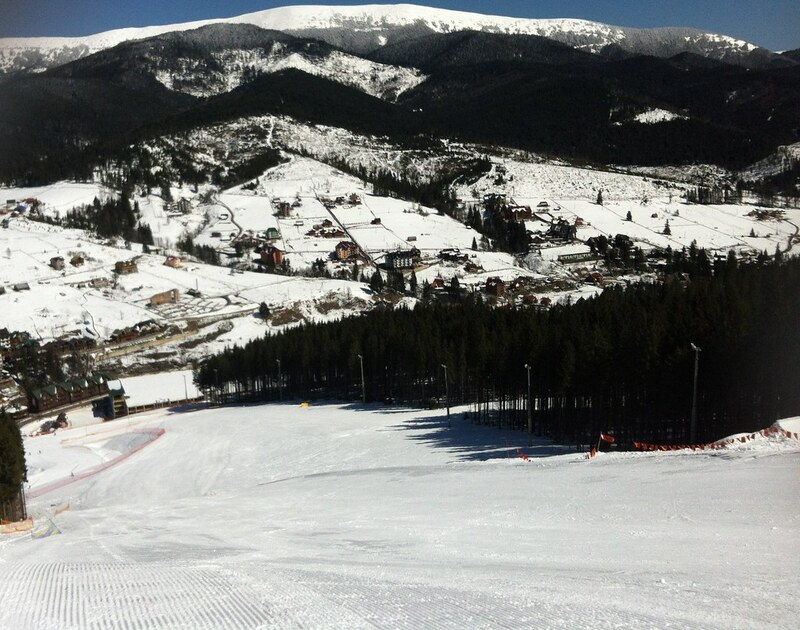 Once I could ski on intermediate slope, I could choose many ways than yesterday. I could take most of lift and explore. Even I found very interesting slope. I could see snow melting on the mountain. 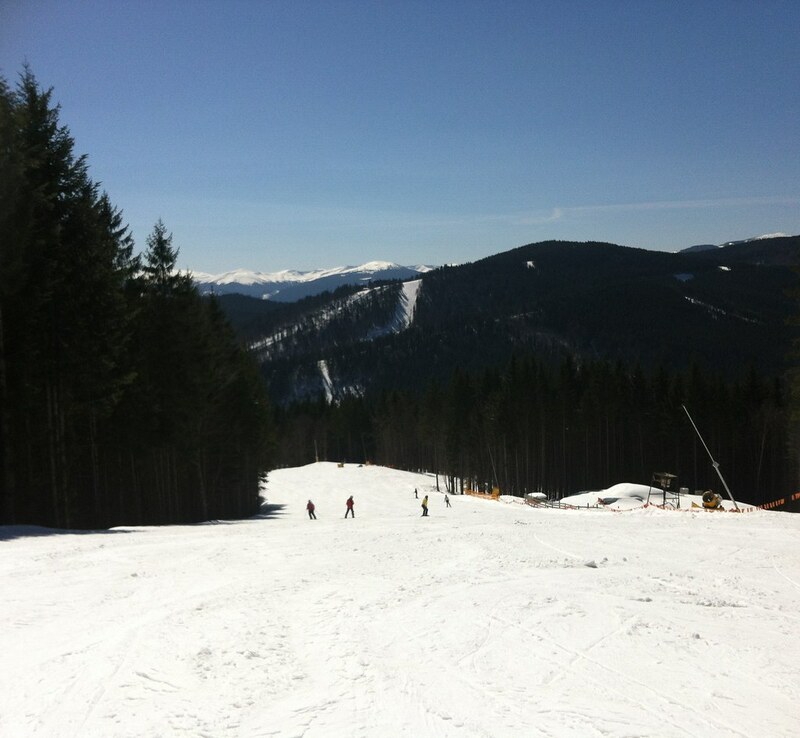 One of attractive things on Bukovel was I could ski between forest. There was no noise of car or city. Usually this kind of route was on the beginner slope. 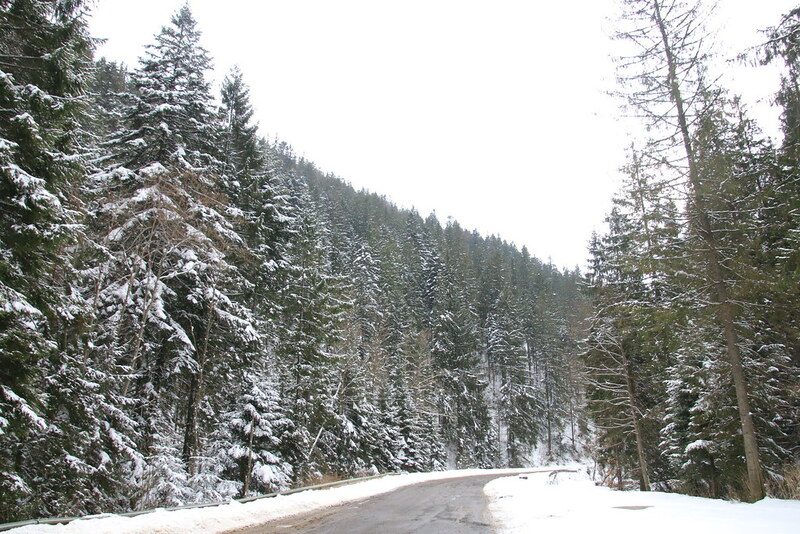 Ivan told me this ski resort was very special place because here were many trees. He told me normally many ski resort didn’t have high tall trees. It was so good that trees and forest gave me lots of good feeling. 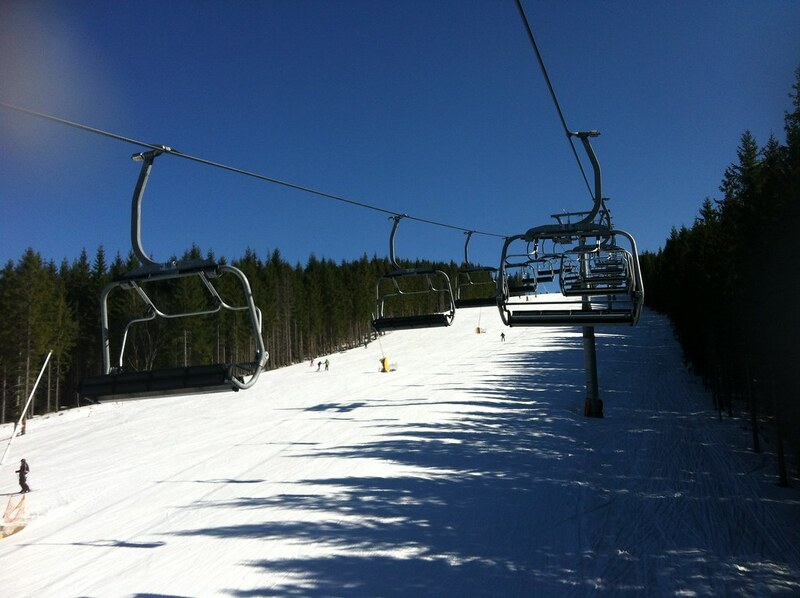 In the morning and late afternoon, I could hear bird tweeting while sitting on the lift or skiing. It was so lovely moment. 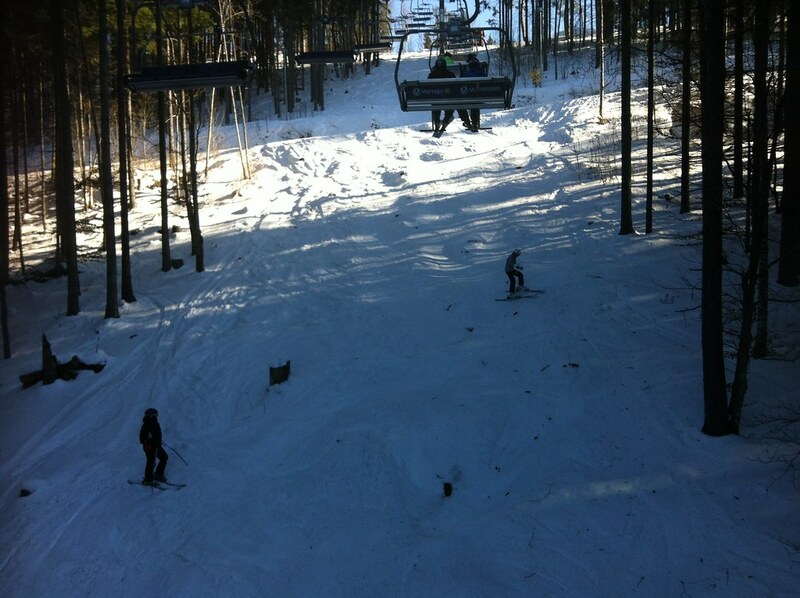 Also to move between top of trees on the lift were so fantastic. 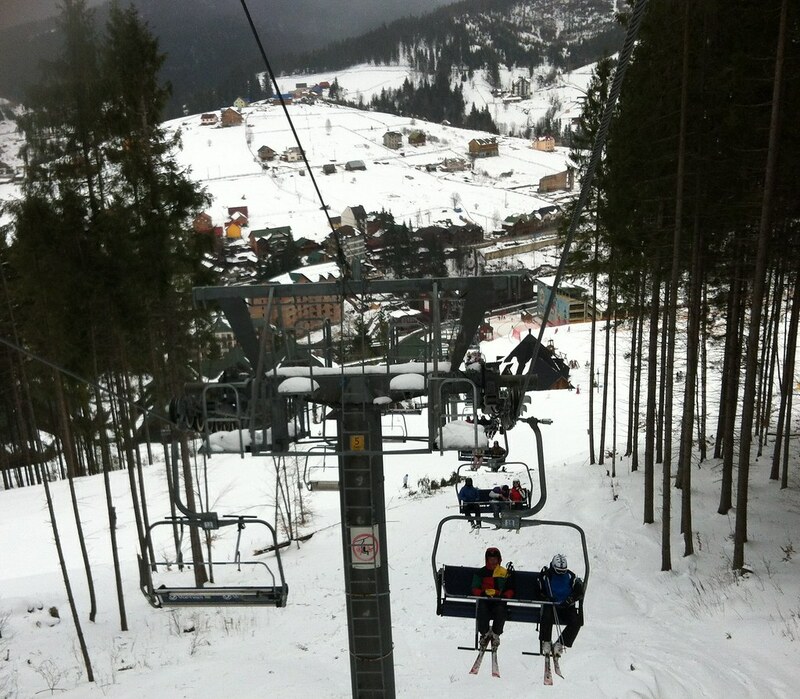 I really loved this ski resort. The other guy who had advanced skill told me he didn’t like advanced slope because it was too short and not many chance to enjoy the forest. Usually black route was shorter. 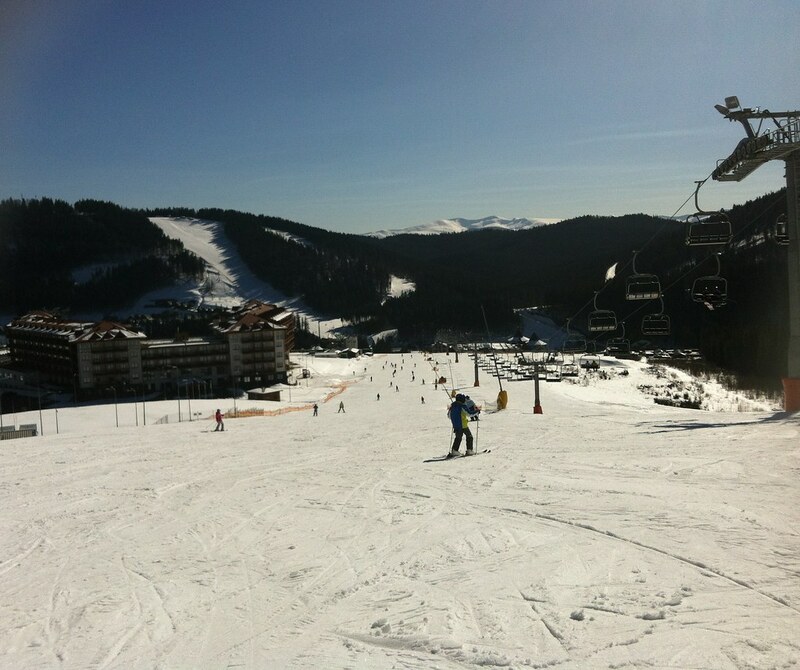 Today was fifth day on the ski resort. After 4:30pm, I could use only 1,2, and 7 lift. 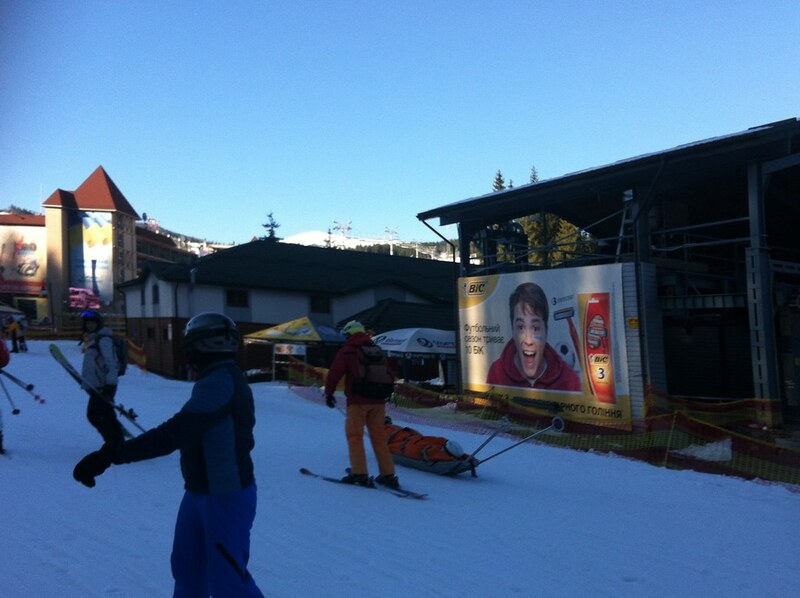 So I tried to ski on the other place which would close after 4:30pm. In the morning there were lines everywhere on the ground. I was a bit used to it. 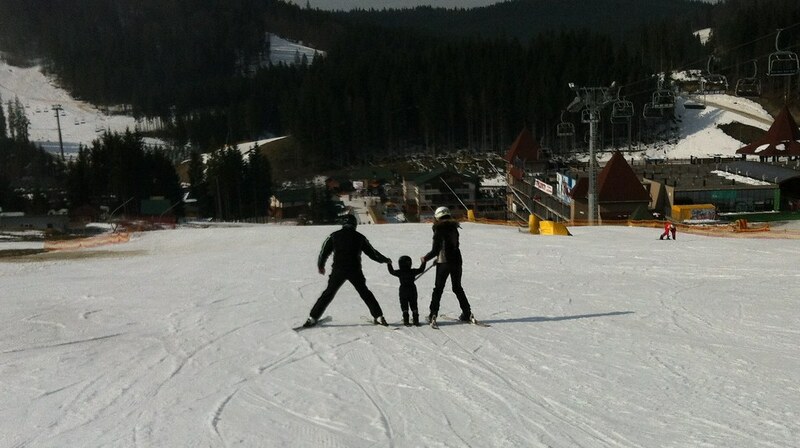 It was interesting to see how parents taught their child skiing. 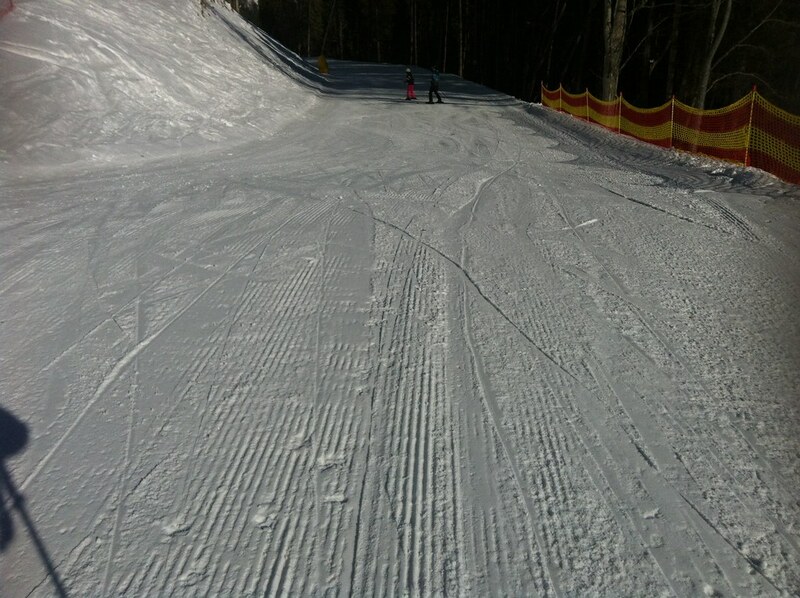 Although I skied on the intermediate slope, I was not good. 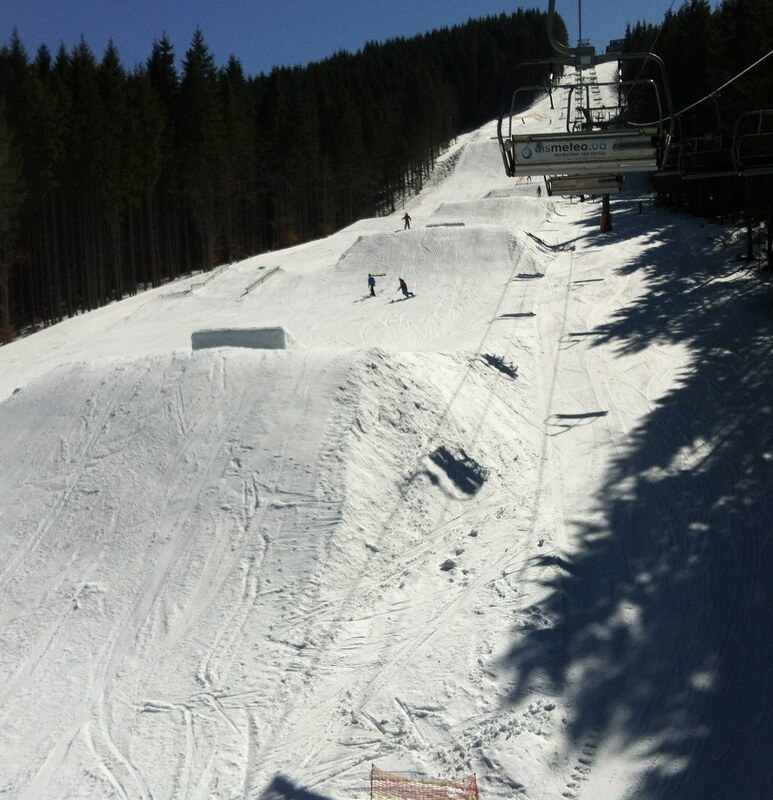 I just went skiing very slowly by making big zigzag. 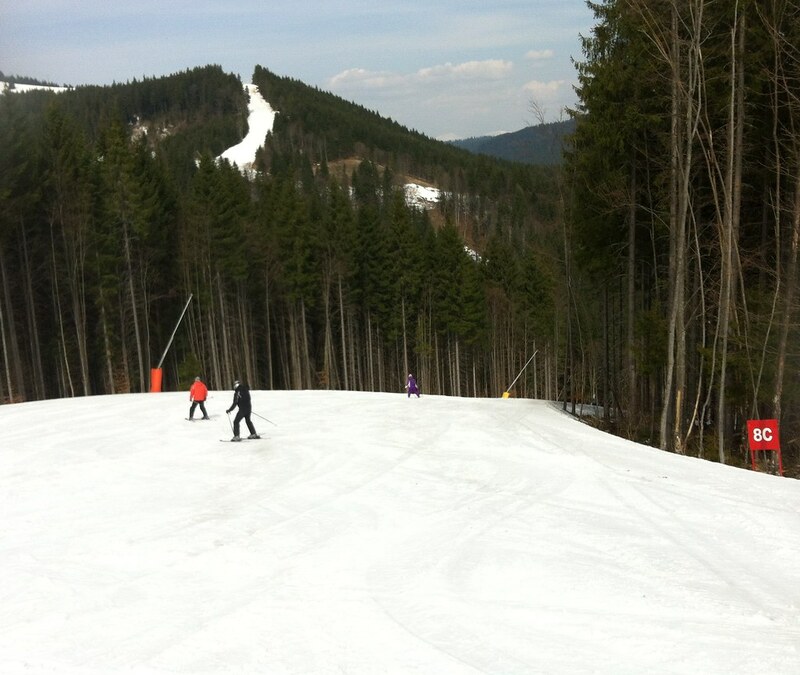 Fifth day was the day of exploring that I tried many different slopes. I had pain with knees every day, but I really enjoyed. 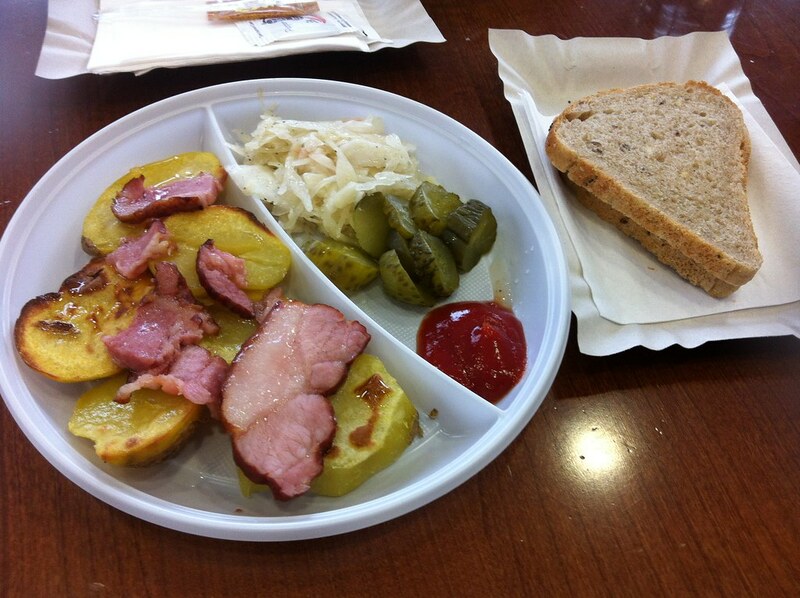 I had something every lunch at the restaurant. Usually I had spent 3~5$ for it. I thought if I came here on busy season, I would spend much more money. It was funny to have the advantage of slow season. It rained at the afternoon. 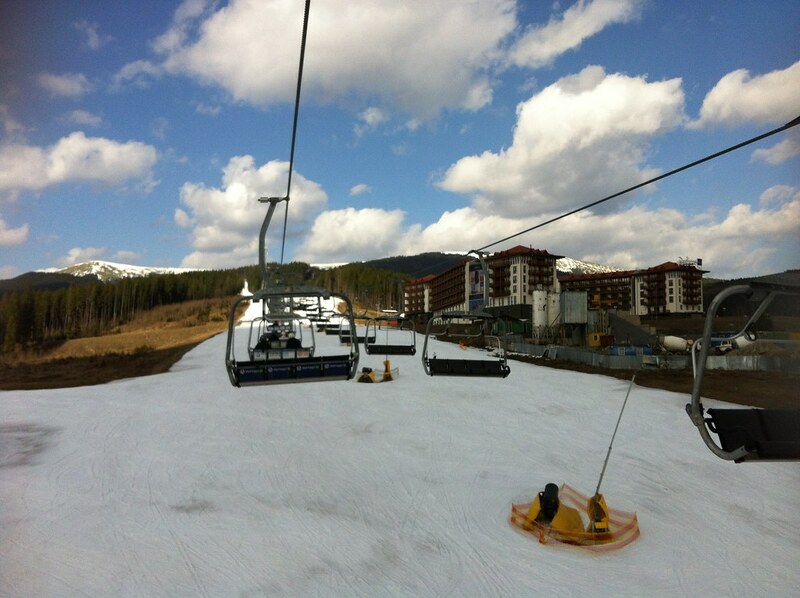 It seemed that it was time to leave the ski resort. The snow was melting and melting every day. At the afternoon it was difficult to ski because it was like sand. 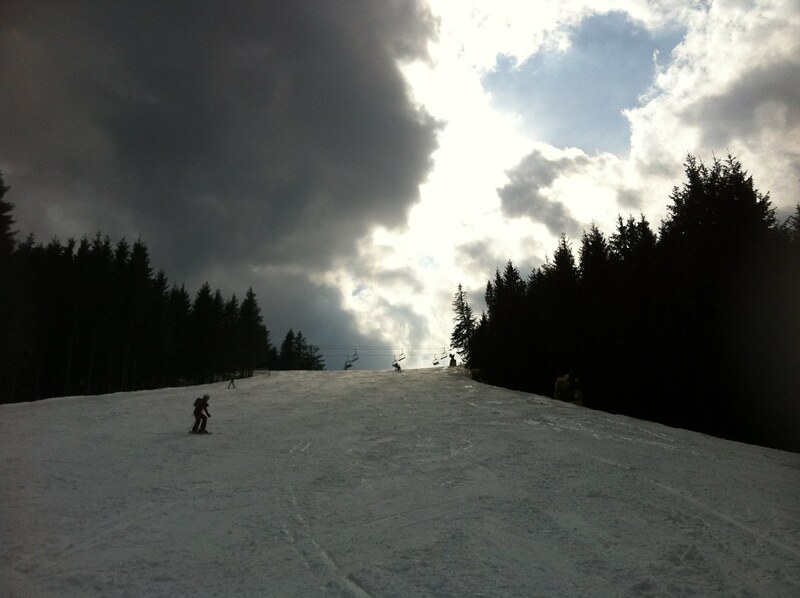 When it was cloudy, then slope was good to ski. 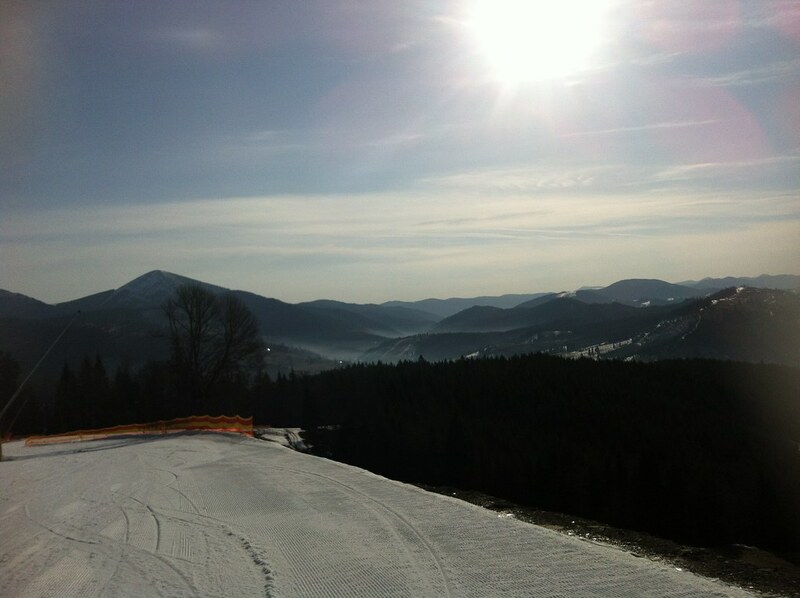 It was funny that in the morning it was the best to do skiing. And then 1~3pm was not good time because it was time to melt. And then after 5 pm it got better again. But lift 1 slope got worse at the end of day because the slop faced the sun all day. By the way I didn’t fall on the hell of hell slope anymore. It was not hell of hell anymore to me. Ivan told me there were too many people on a busy season that people had to wait a long line to take a lift or eat something on the restaurant. Actually slow season was better chance to practice because there were not many people to hit. I didn’t see any crashing between people and also I never hit anyone. Actually melting snow was helpful because it made speed slow. As a beginner, it was better to practice. Later I was so confidence that I enjoyed the speed on the practice slope which was very wide. And then the accident happened too suddenly. I could not remember how I fell. I asked Ivan that he ever had a big accident. He told me that one time he fell badly and could not remember anything. I didn’t understand what he meant because I remembered how I fell every time. This time was really different. I realized when the speed was too fast, and then I could not see how I fell. Skis were detached from the boot and flew far away. I hit ground too badly. 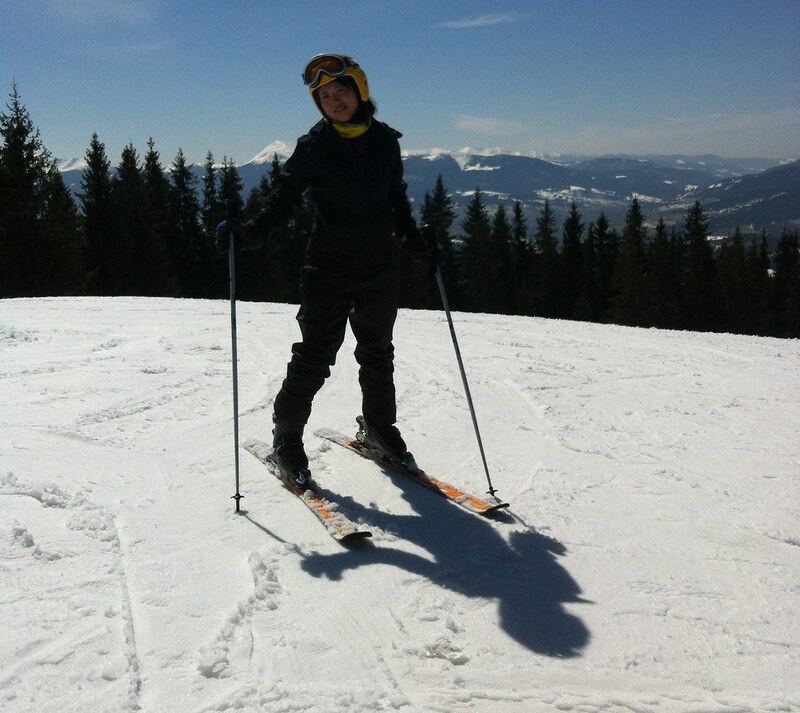 I was curious why I had to wear a helmet during skiing, because when I fell, only my knees or hips hit the ground. But this time my head hit the ground too strongly. 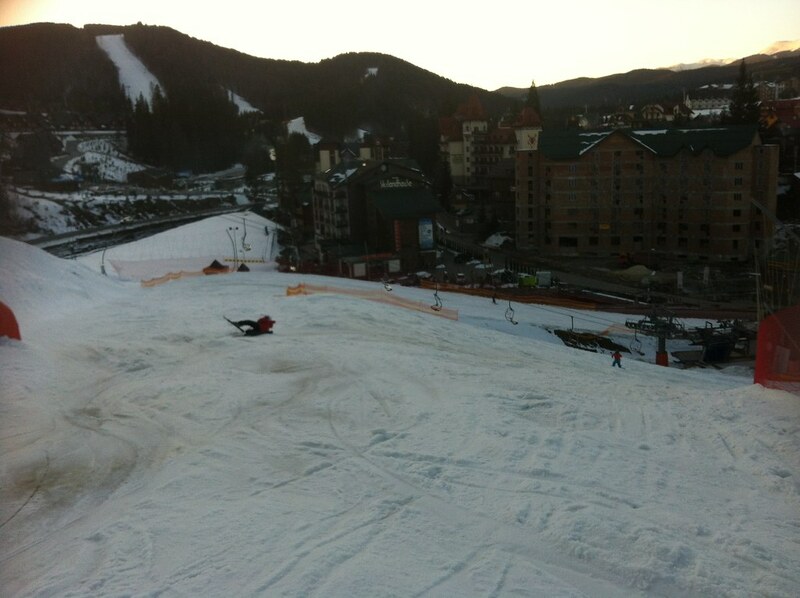 I guessed if I didn’t wear helmet, ski slope’s color could be changed to the red with my blood. After a few minutes I could stand up and take my skis. 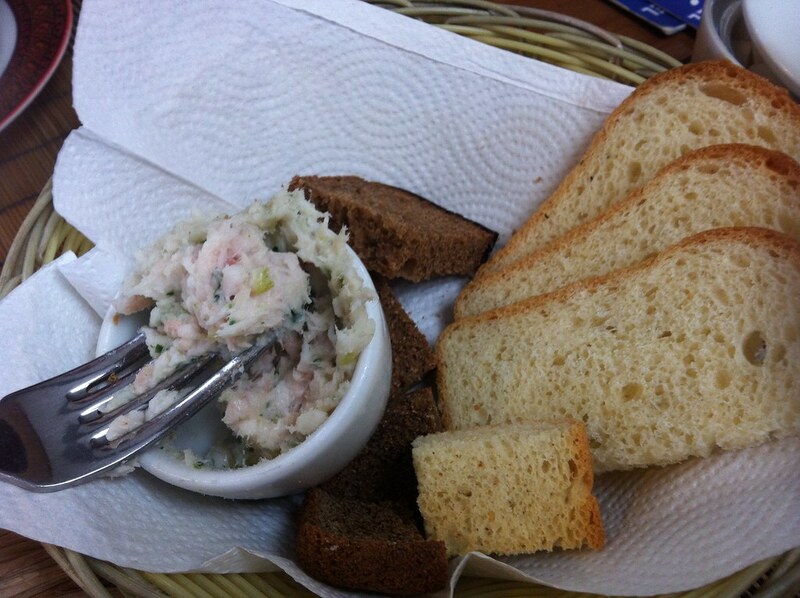 For two weeks I had problem to open my mouth when I ate something. I thought there was some shock with my jaw. 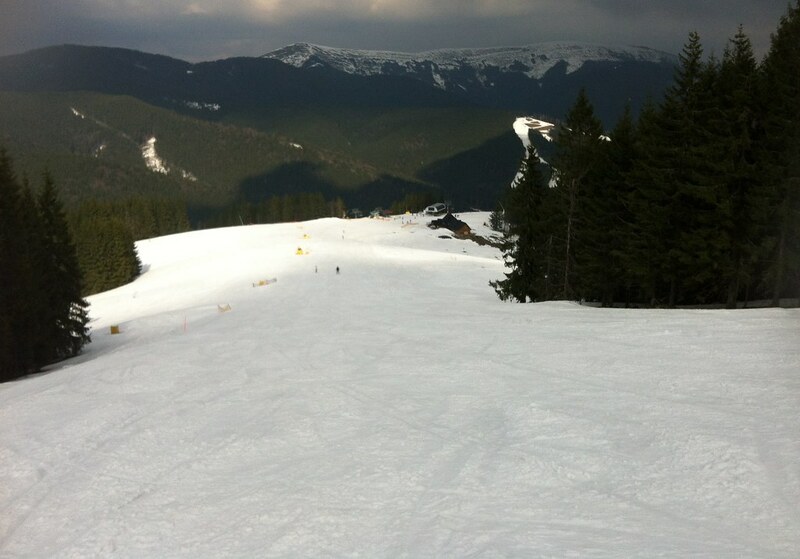 After taking the rest at the down, I could ski again. I found very interesting person. I usually didn’t talk to the person first. But when I was too curious, then I started to talk first. I asked him what he was holding. 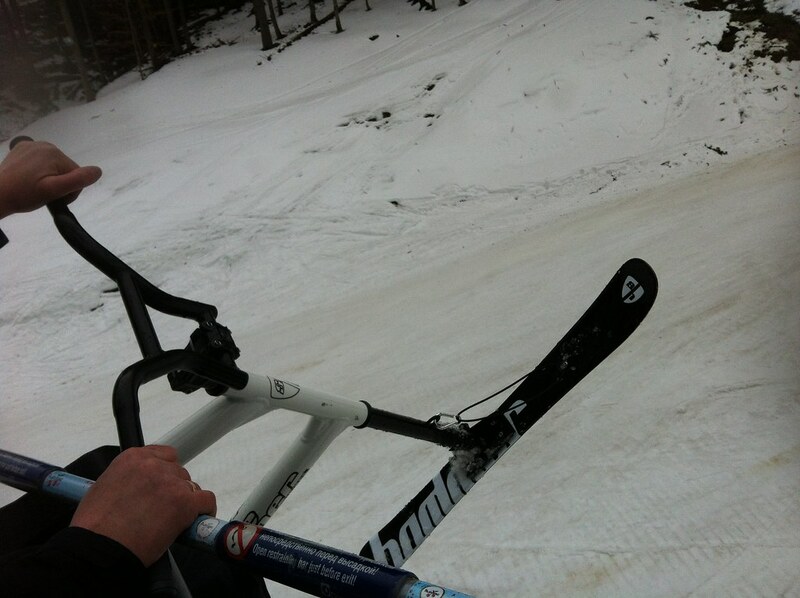 He told me it was kind of ski bike. He was so fast that I could not catch him. 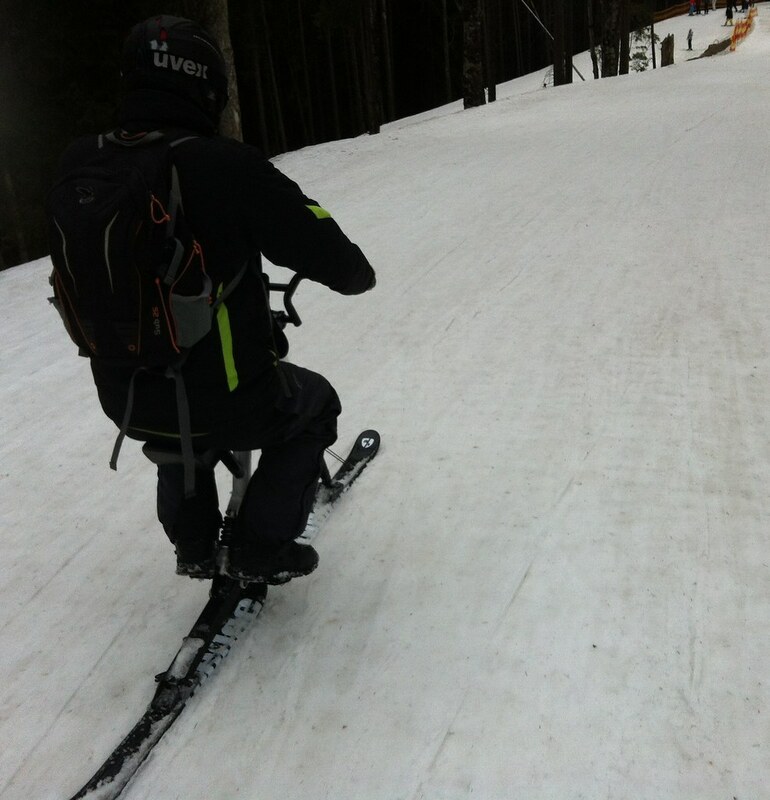 I felt like I should do this ski bike because I told I am cycling around the world. It was an advanced slop on lift 1 which was very steep. I only passed here every day because it was way to a beginner slop. I decided to ski here today. The little child started first. I felt like she made fun of me. 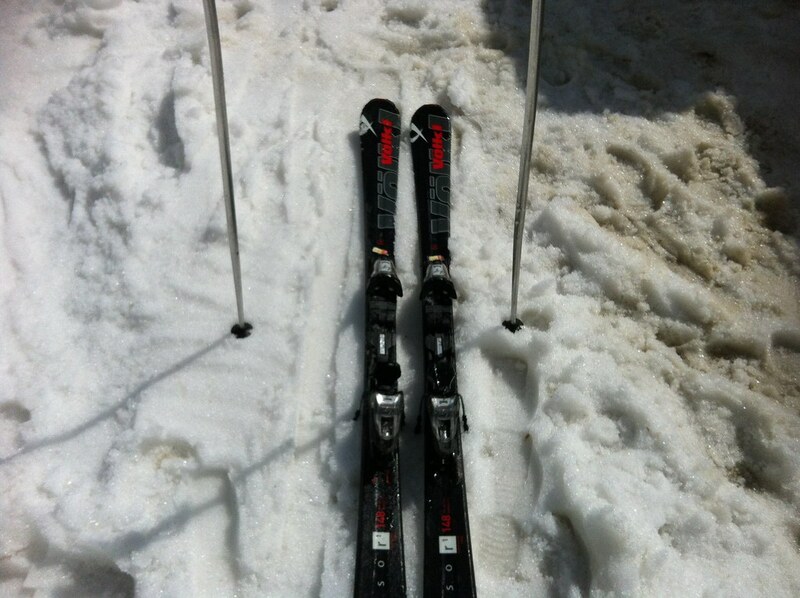 I tried to have lots of courage to ski. I moved from left to right. 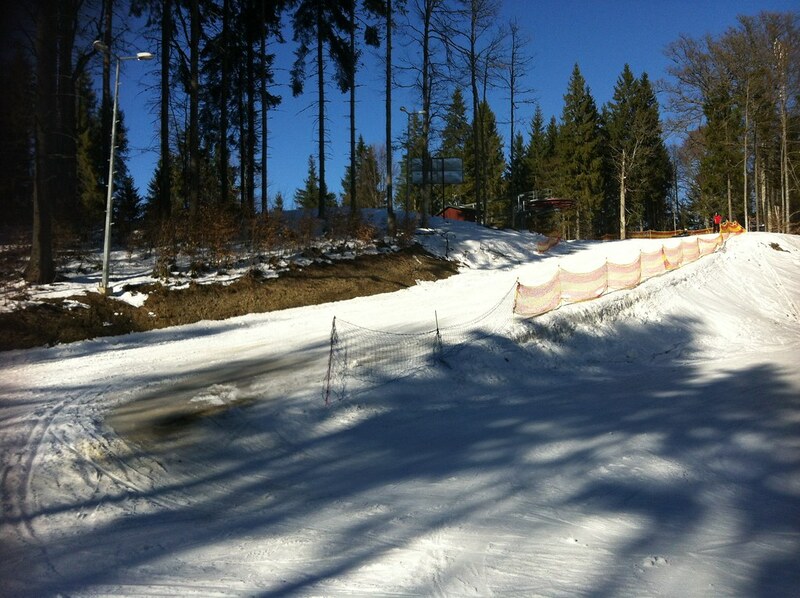 I always had the problem to turn and especially it was very difficult on the steep slope. So, when I tried to turn on this slope, I fell often. 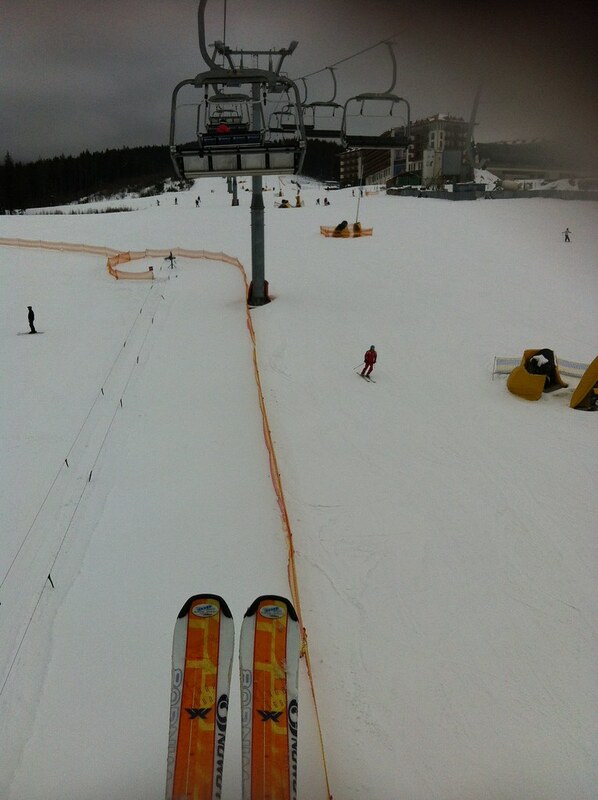 Finally I succeed to overcome fear of steepest slope here. 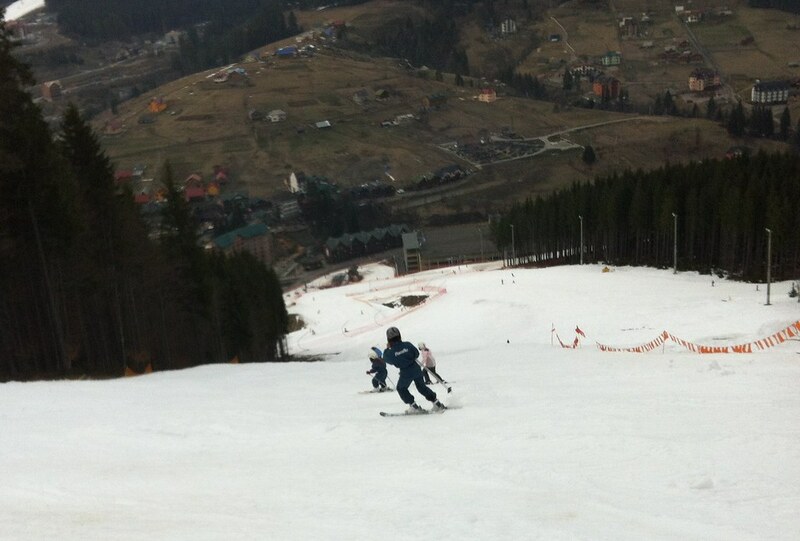 On fifth day I did skiing on an advanced slope. Good job! 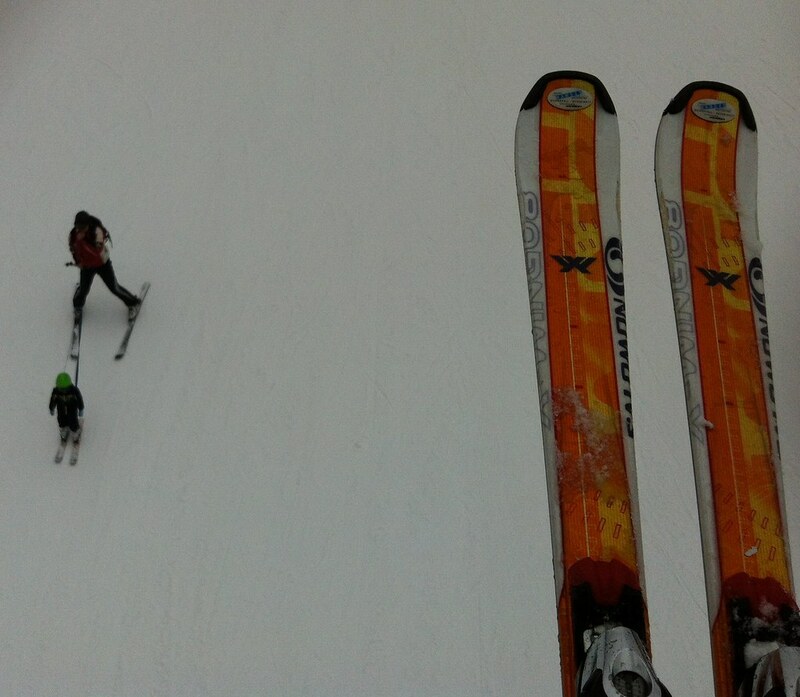 I found interesting thing that some people walked to the top with ski. Was it for exercise? I didn’t know. 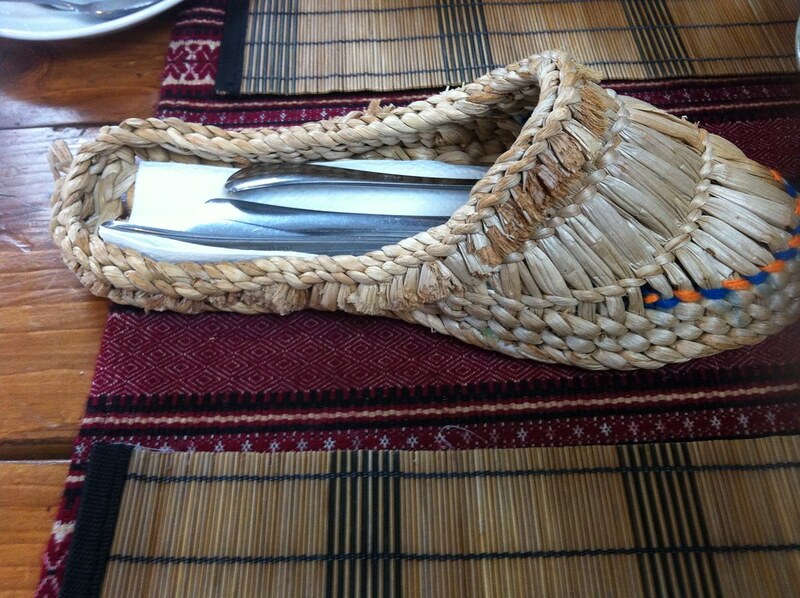 I usually had simple thing for the dinner. I cooked something on the balcony with my gas stove. But today I was too tired that I bought something. At the next day I was supposed to go skiing only at the morning and leave at the afternoon. While skiing in the morning, my mind was complicating. I didn’t want to leave. I checked the weather and tomorrow would be colder than today. I decided to stay one more day. I came 1 pm to the hotel. It was weird day because I came to the hotel too early. 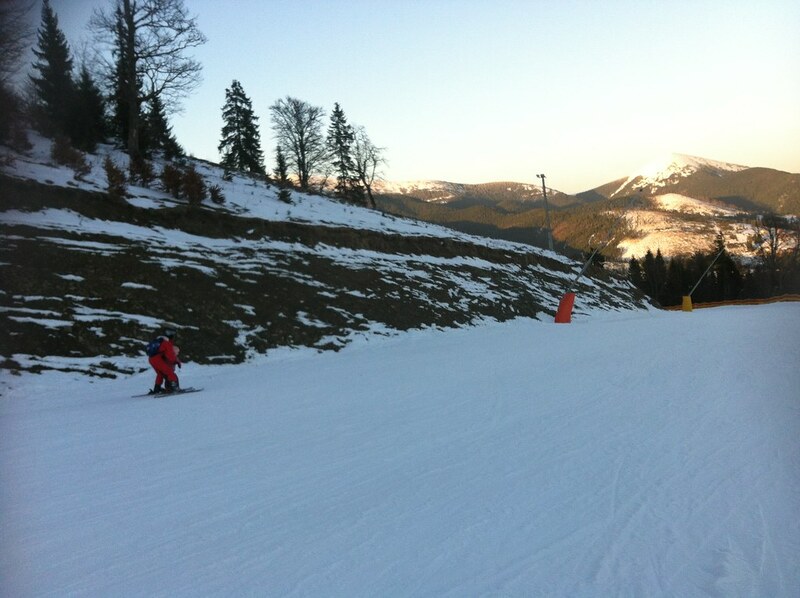 I usually skied from 9~10 am to 7:30 pm every day. It was the secret how I could improve my ski skill. Just stay at the slope all day. 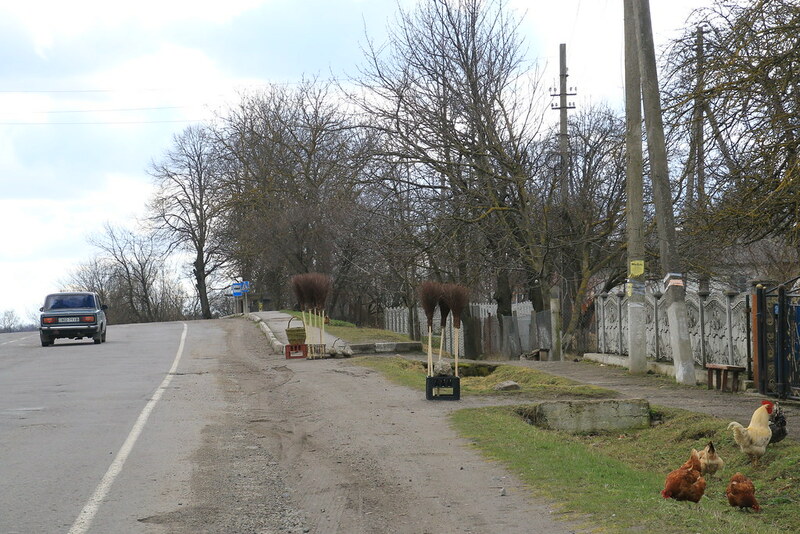 I had lots of time today that I went to the other village which was 3 km (1.8 mi) far to buy something on a grocery. The grocery on the resort was more expensive. Today I bought many things. 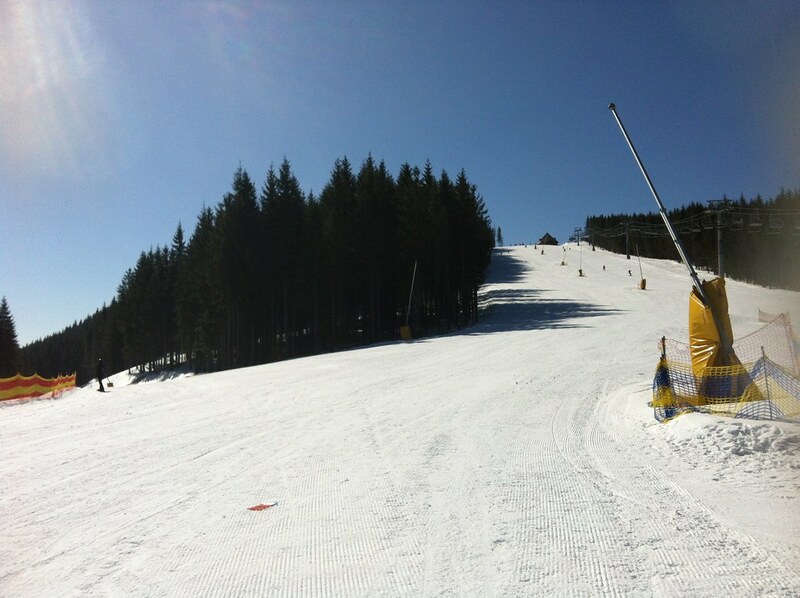 At the next day, I saw my yellow ski was gone. The worker took it to renting room by mistake. He gave me other black ski. He told me the black one was only 1 or 2 years old that it was much better. 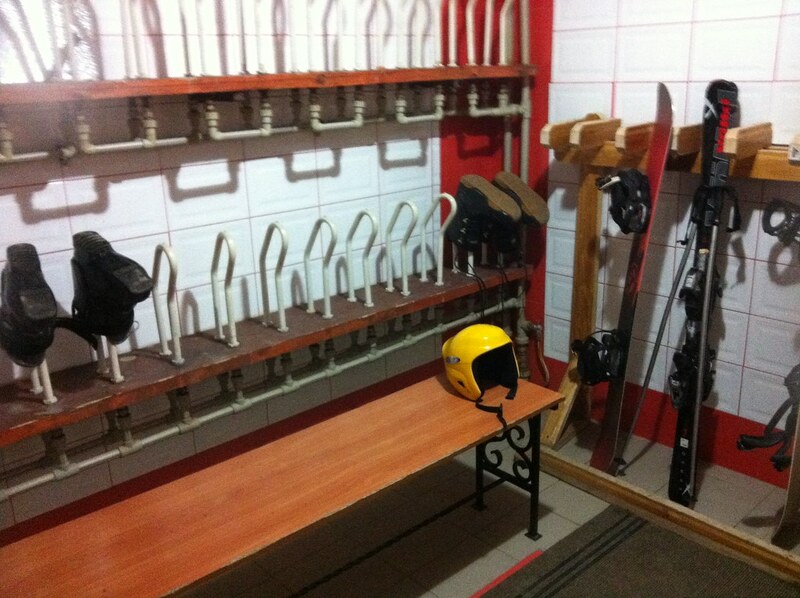 Actually at the first day he handed me other ski, but I denied and chose yellow ski. I realized what I chose was the very old bad ski at the last day. 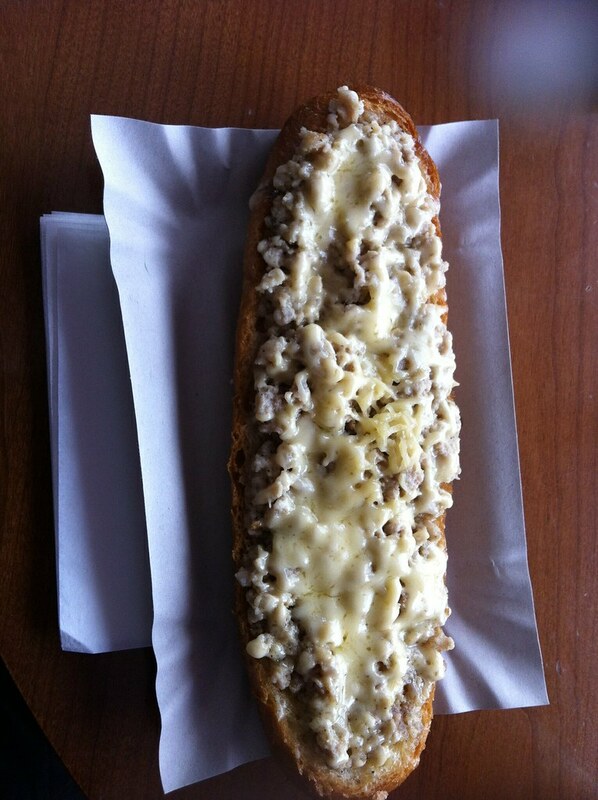 The worker could not speak English well that he just let me use what I chose, I guessed. 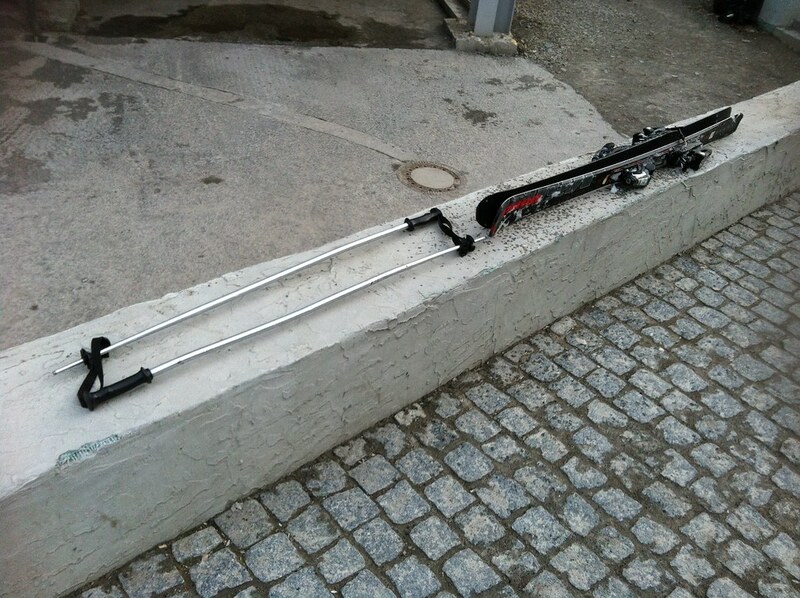 This ski was made in Germany and lighter than yellow one. I even see less scratch on the bottom. 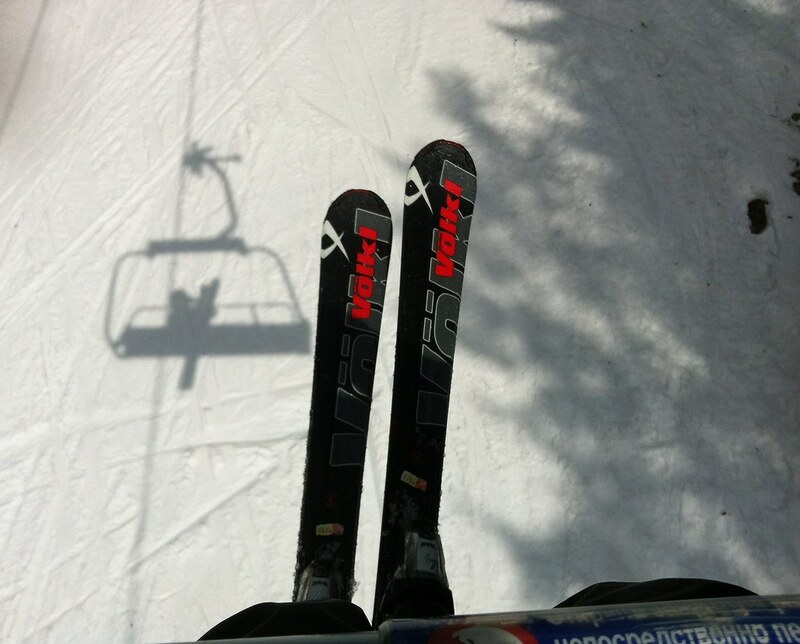 It was so funny to have a good ski at the last day. It was suddenly colder that I could see icicles. I usually had two layer gloves. But it was too warm for a few days that usually I put one pair of them to my pocket. And I lost one of them. So I felt cold with one hand. When I waited the lift coming, one Asian talked to me. 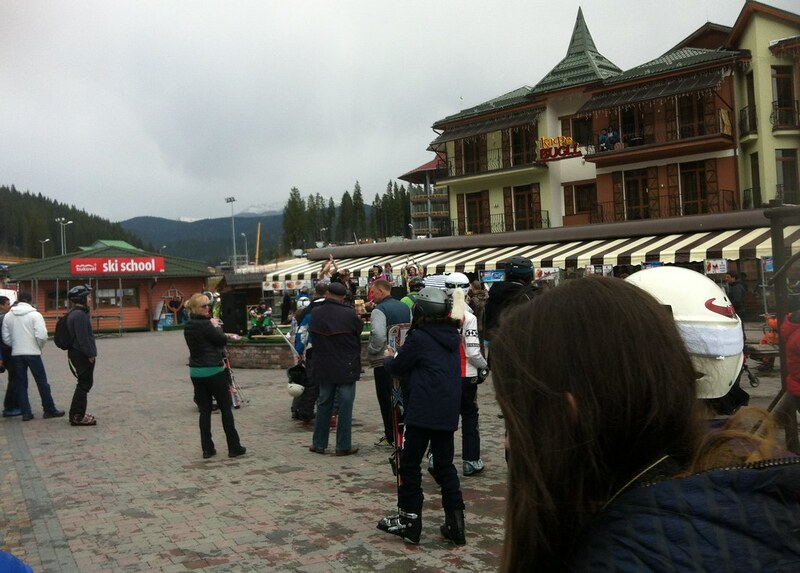 It was so surprising to see Asian because I had never seen other foreigner in Bukovel. He was Chinese and studying in Lviv. He told me he came here quite often and he skied since little child in China. 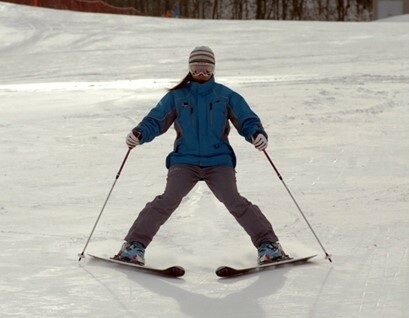 It seemed like I only met an advanced skier. His name was Yongming and he took the video of me with Gopro. I was very excited to have it because I thought I would look like a professional skier. He skied so fast that later afternoon we separated. We made an appointment to meet at the night to get a video from gopro. 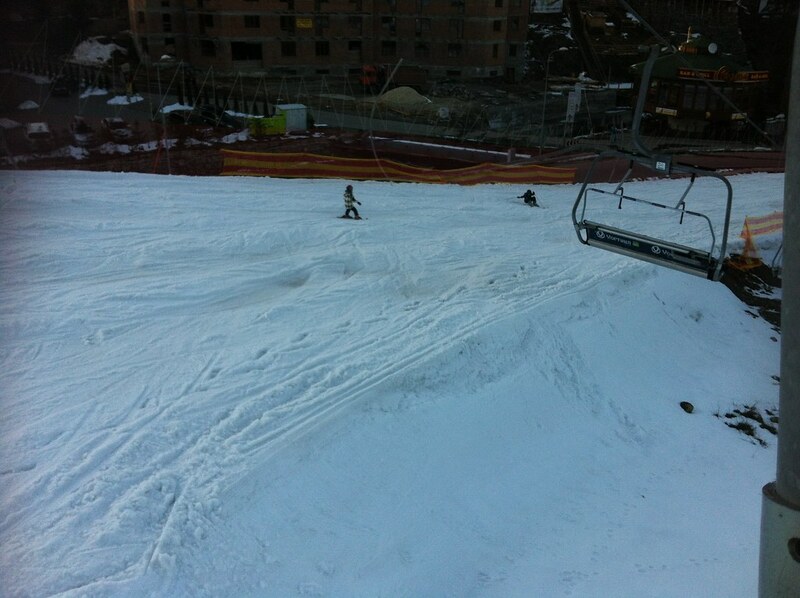 It was practice slope. I could see snow melting on the ground. It was really bad condition. I could figure out who abeginner and advanced skier were now. Definitely on the picture, she was a beginner. There were everywhere frog these days and also too many dead frog on the road. The frog on the picture succeeds to reach to mud. I wanted to help, but I could not touch it because it looked scary. 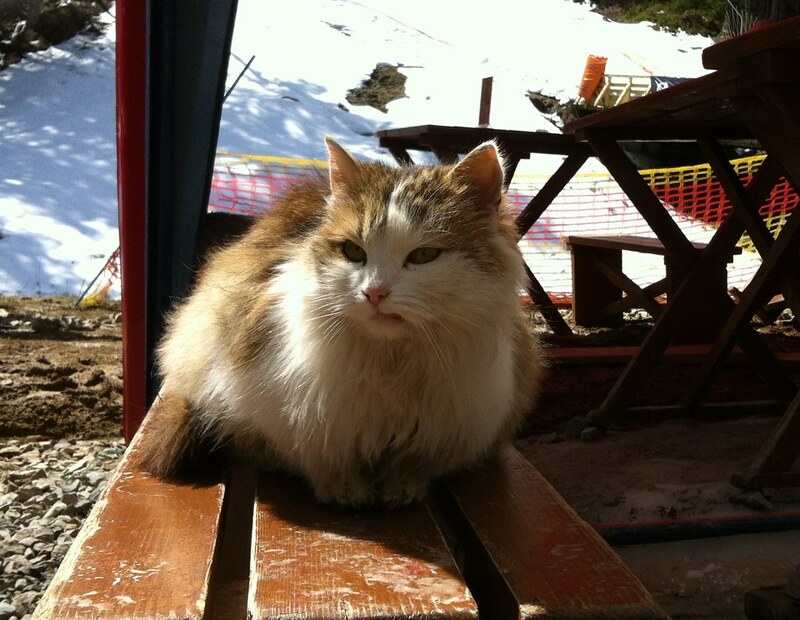 I was so interesting to see how worked on ski resort. Once I put my ski pass on the jacket, the machine read automatically that I didn’t need to touch by myself. What a good system! There was line for VIP, but I didn’t see people use it because it was slow season. There was no reason to buy VIP ticket. It was one of amazing time on the trip ever. Ski was quite heavy to me. It was the way how to carry. I really loved black ski because it was lighter. My ski boots were bad that actually every day my socks were wet. The snow melting covered my shoes all the time and it went to inside. 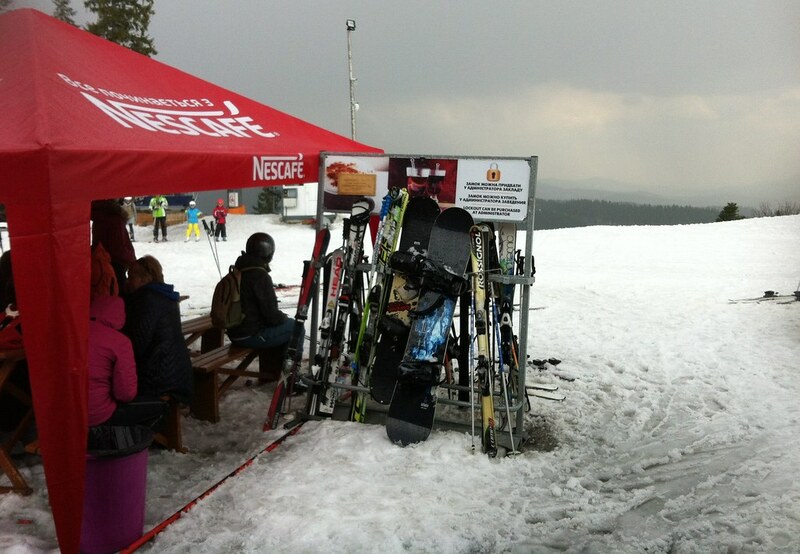 I was not sure it was normal because of melting snow or my ski boots were too cheap to work well. It was the storage room. The pipe was heater that if I put my boots there and then next morning I could have dried boots. It was time to leave. The left one was from the first day. The right one was at the last day. Practice slope. The left was at 8th of April. The right one as at 14th of April. 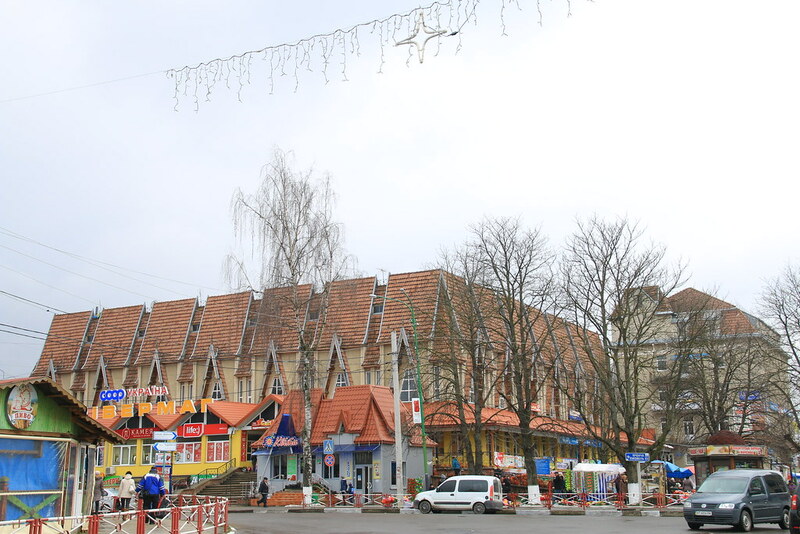 The building at the right on the picture was Radison. I saw the price that it was over 200$ for one night on Booking.com. I was curious that how much it would be on the busy season. I really loved the winter because everything became white. The best art of the earth was winter! 227$ for a week was more than usuall to a budget traveler. 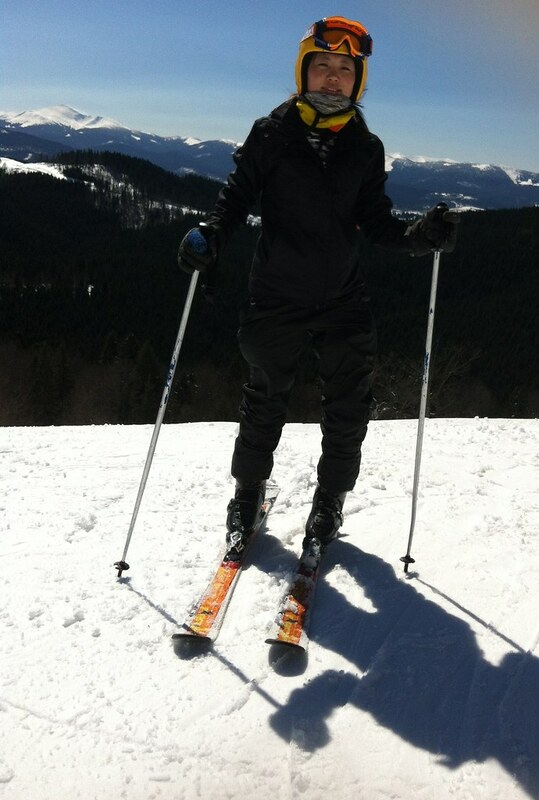 But I did enjoy so much skiing. It was really best moment in the trip. If I was on a busy season or last year, I would stay only one day or even I would not try to come here. 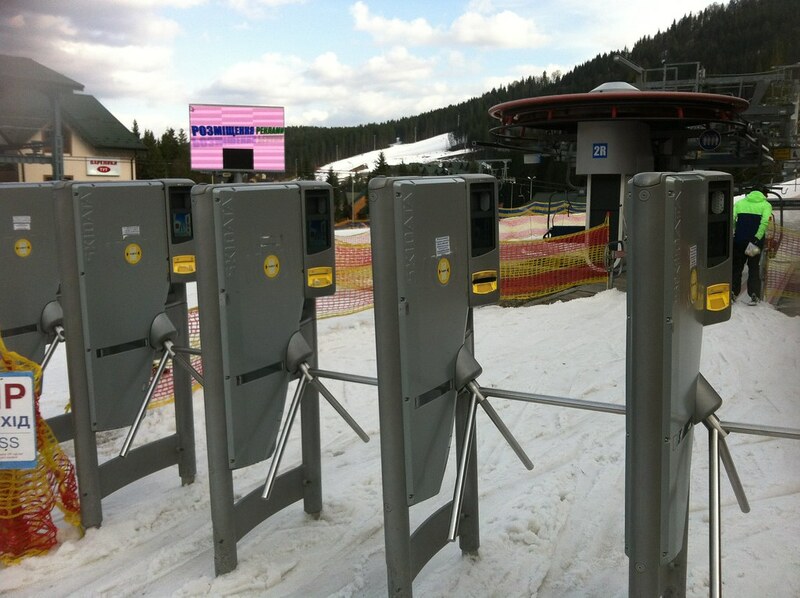 I heard that ski pass was only 30~40 $ in the Western Europe. I thought it was cheaper than here or South Korea. I would love to go there one day!! I could checked which lift I’ve taken with my ski pass’s number. Interesting thing was even I could see it after a few months. Number of my ski pass..
Oh.. I wanted to organized once I saw the number although I didn’t have the time. Lift 1,2,7,13 = Total 4 kinds of lift and total 17 times I took. It looked like I could take the lift three to four times per hour. I never wait long line. All the time I took the lift as soon as I arrived. 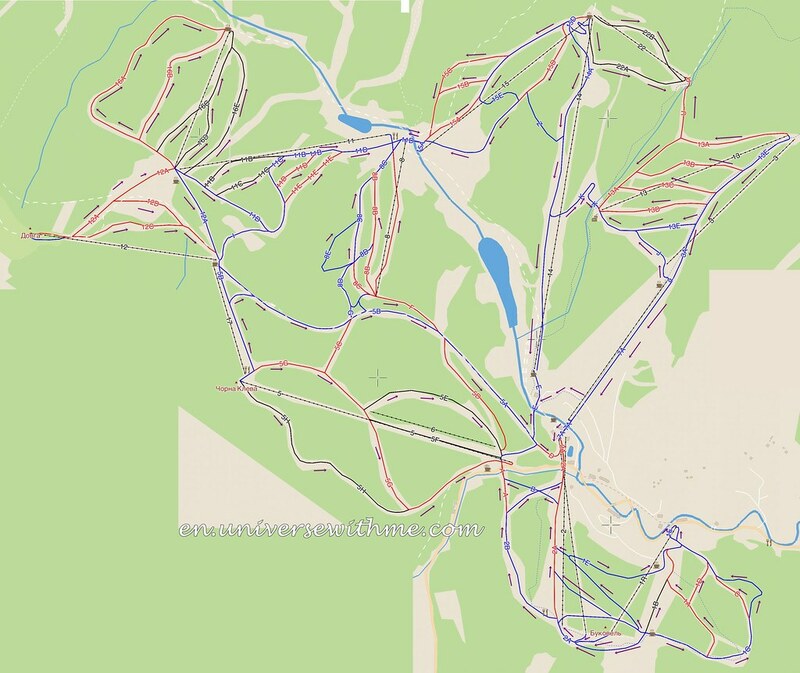 I made the map of my sixth day with the result of ski pass. There were too many lifts that I should have the plan to make this round trip. Wasn’t it not bad as a beginner? (Ukraine) Finally Spring coming? - First time ever to rent a flat in the trip!! 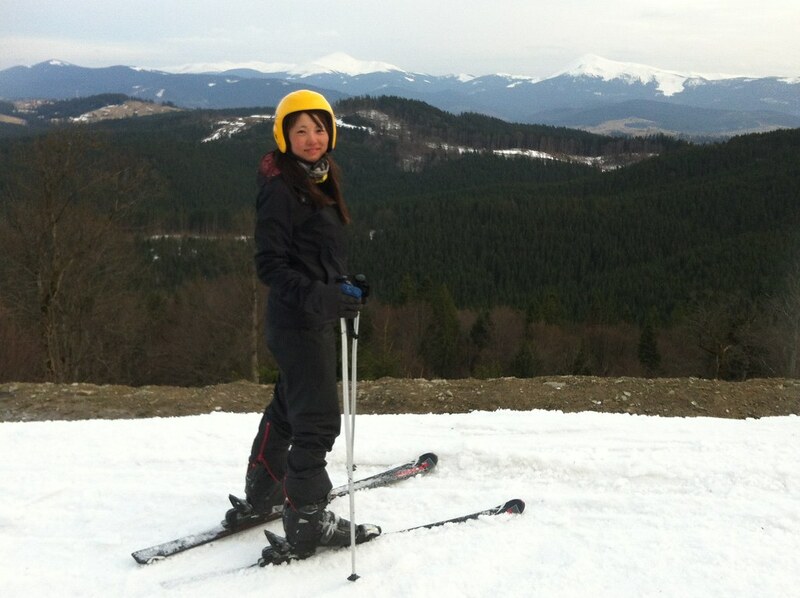 Jin, great to read this, I tried cross country skiing in Norway and found it scary at first . 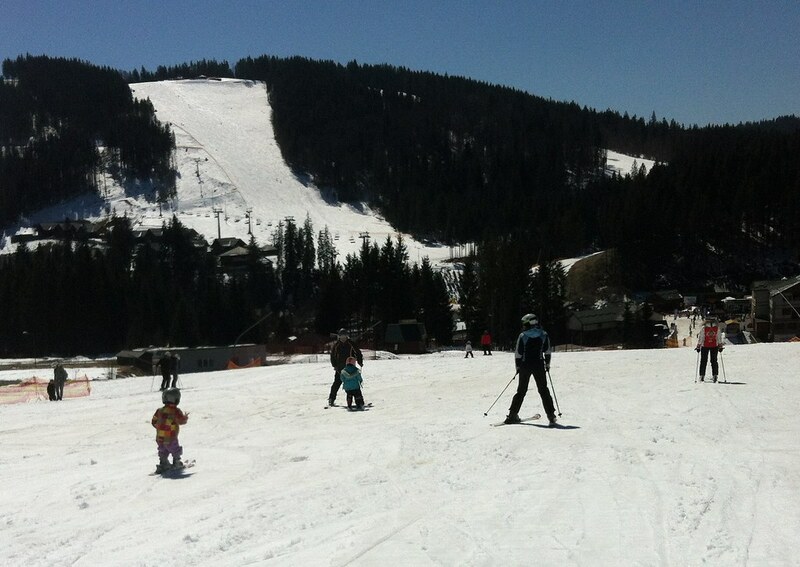 It was wonderful to see tiny children who had only been walking a few months on skis. I am just back from my own little adventure. I hope you had a good time at your adventure! 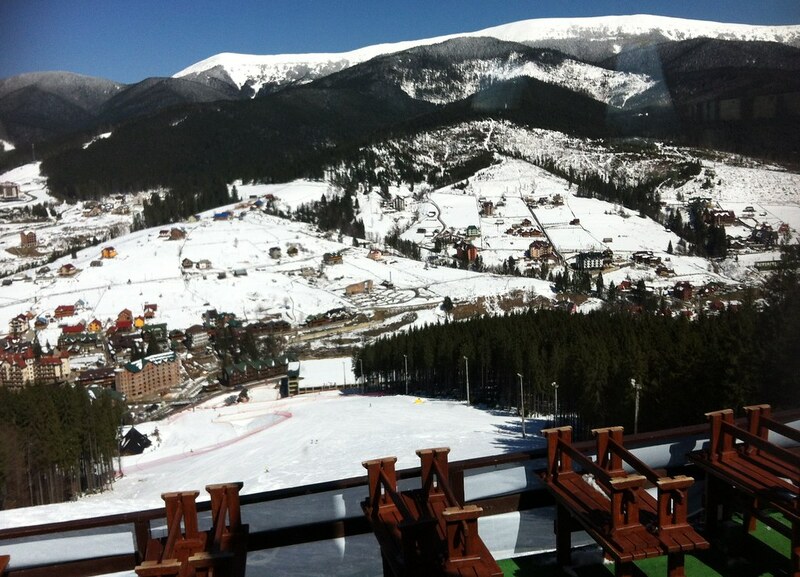 I’m too scared to go skiing! haha. Maybe I’ll learn properly one day. In recent years, its military infrastructure has been systematically destroyed through the neglect, corruption and malfeasance of Ukraine s former leaders, says Mekhed, but bringing them back to working order would require buying up spare parts from Russia, which Moscow has unsurprisingly refused to sell.